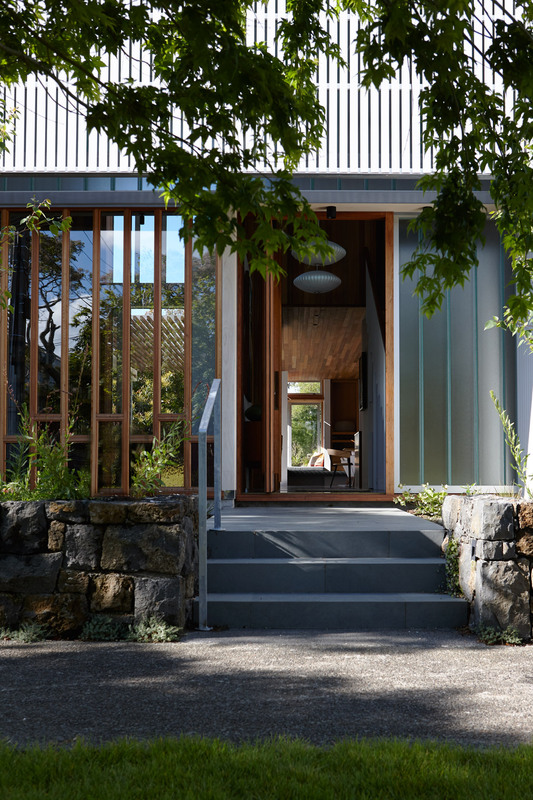 An urban courtyard house occupying a tough public site, this home was designed for my own family. 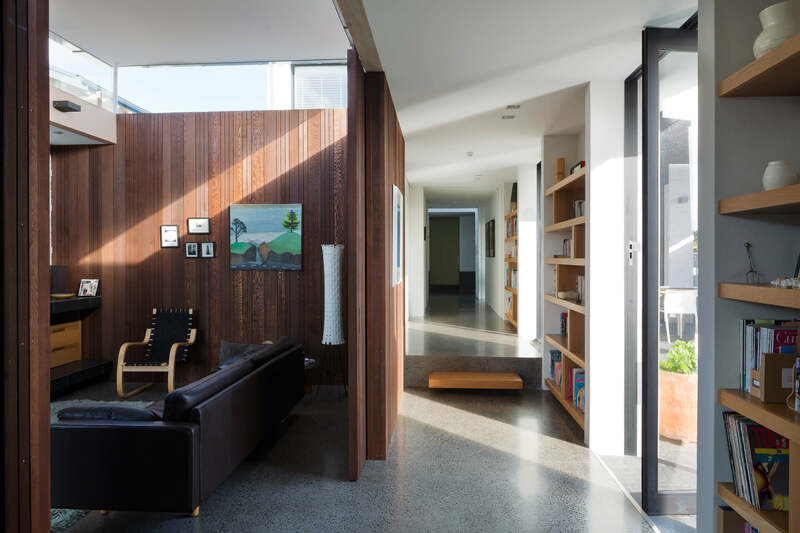 The plan is a response to the corner site’s wedge shape and northerly aspect, as well as the positive experience of living in a previous home with a courtyard arrangement. 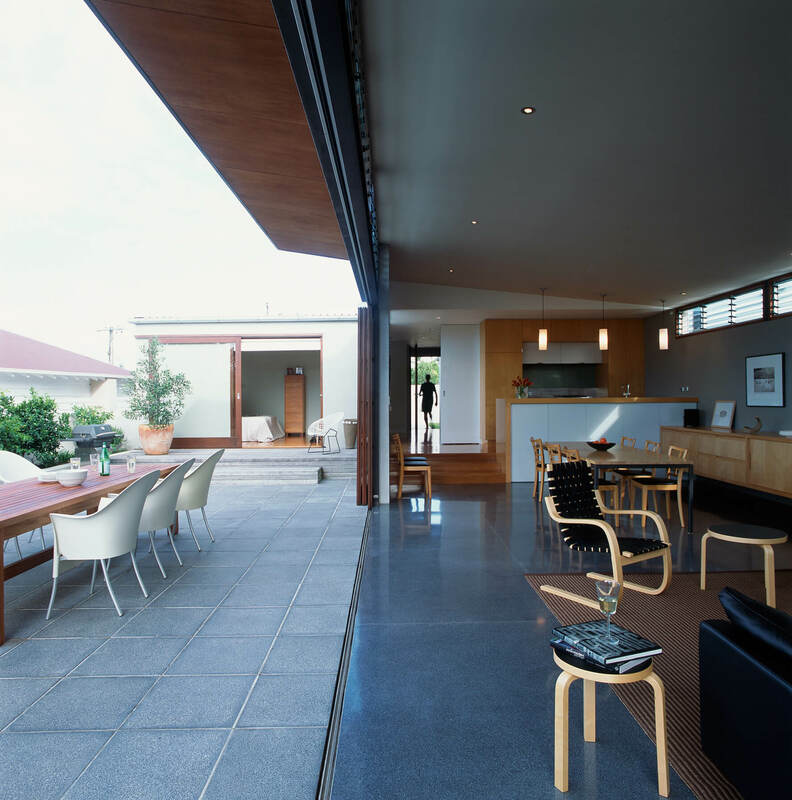 Discretionary planning permission allowed the house to be massed close to both street boundaries, increasing the courtyard area. 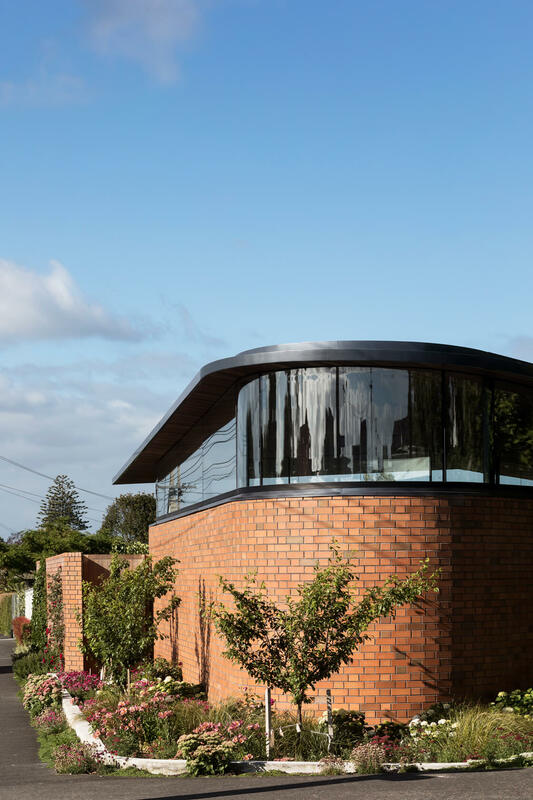 Brick construction references a material used in many of the original houses in the neighbourhood and provides a memory of the previous house on the site. 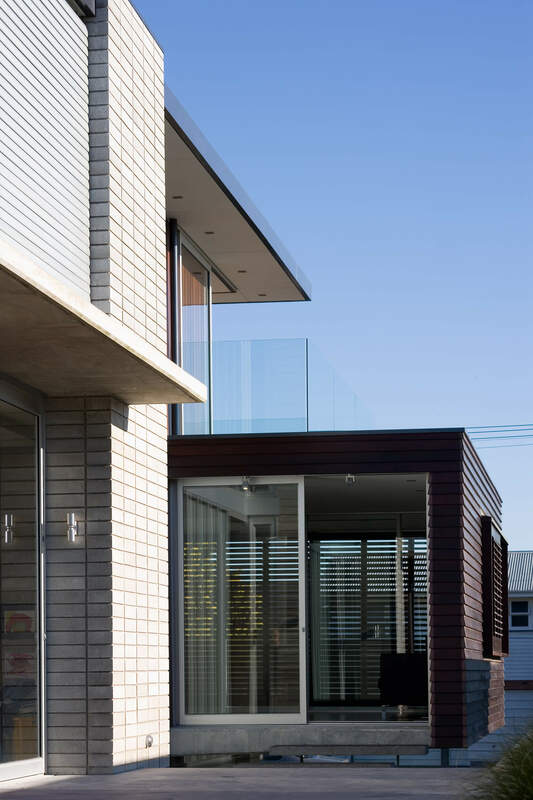 It also creates the solidity required for privacy and sound protection from a busy road, and adds exterior and interior textural richness. 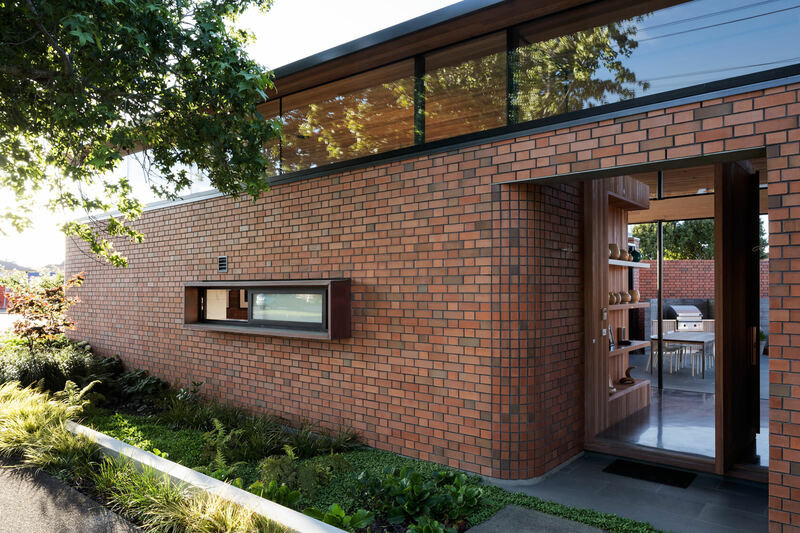 Brick screens and an entrance portal are the only intrusions in the otherwise solid exterior form, which is intended to evoke the sense of a garden wall. 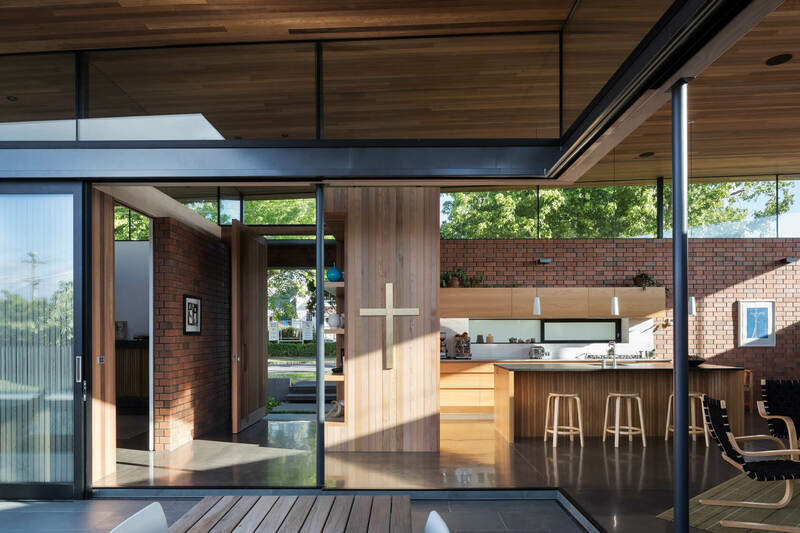 As an alternative to conventional windows, and as a device to reinforce the house’s wall-like qualities, a continuous clerestory separates the floating timber-lined roof from the wall. 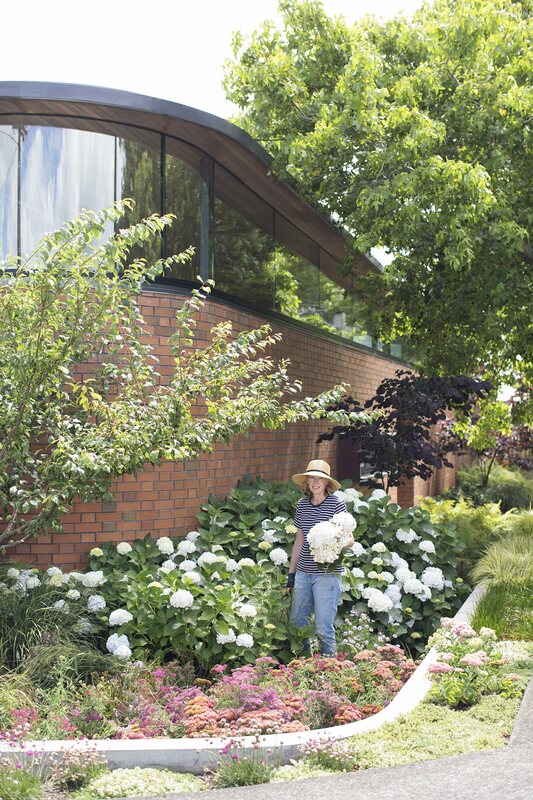 In the space between the wall and the street, densely planted sunken gardens are intended to soften the brick and offer a verdant gift to the street. 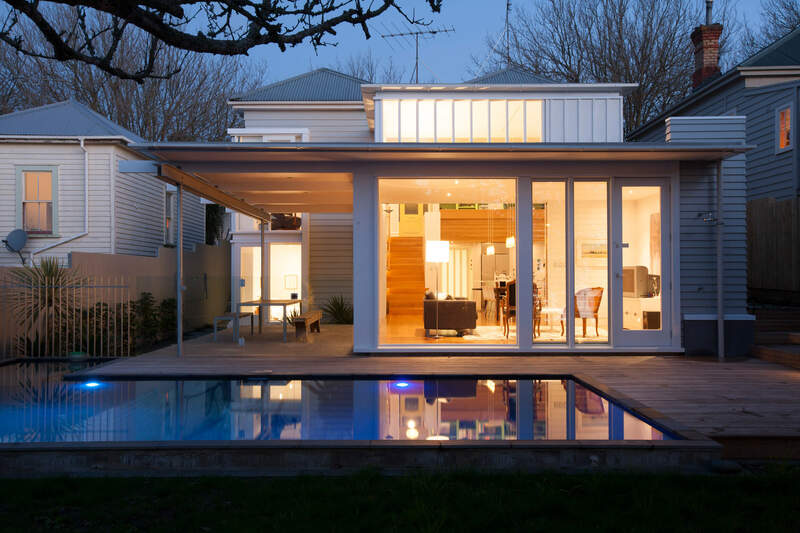 The entire house is disposed around a central pool, valued as much for its sensory as recreational attributes. 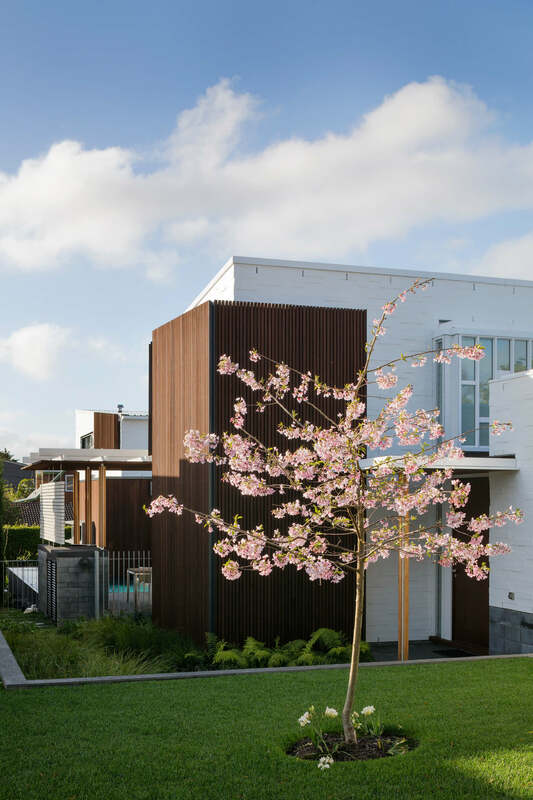 The simple plan form sees the house divided into two zones; public living areas orientated to the busier street side and bedrooms massed along the quieter side road. 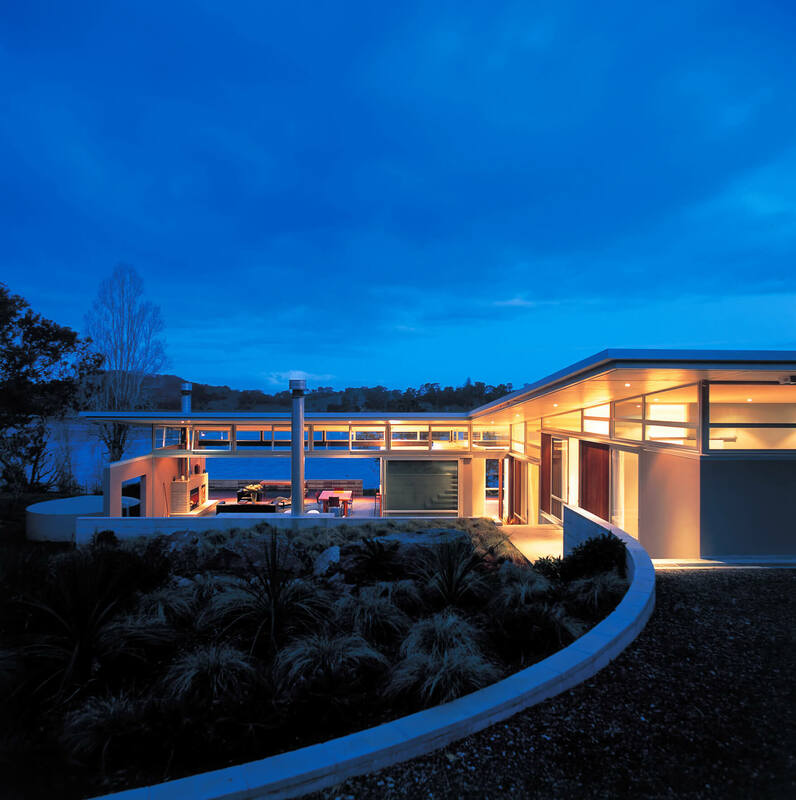 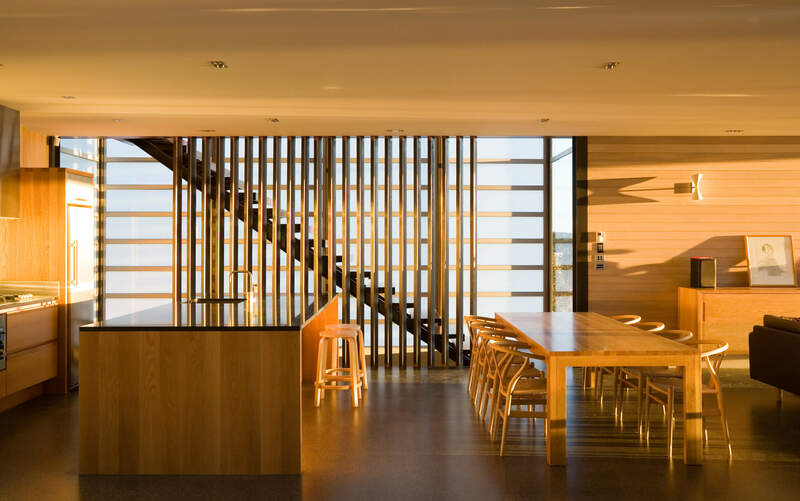 The house’s impenetrable form and intimate relationship to the street challenge traditional perceptions of the New Zealand house typology. 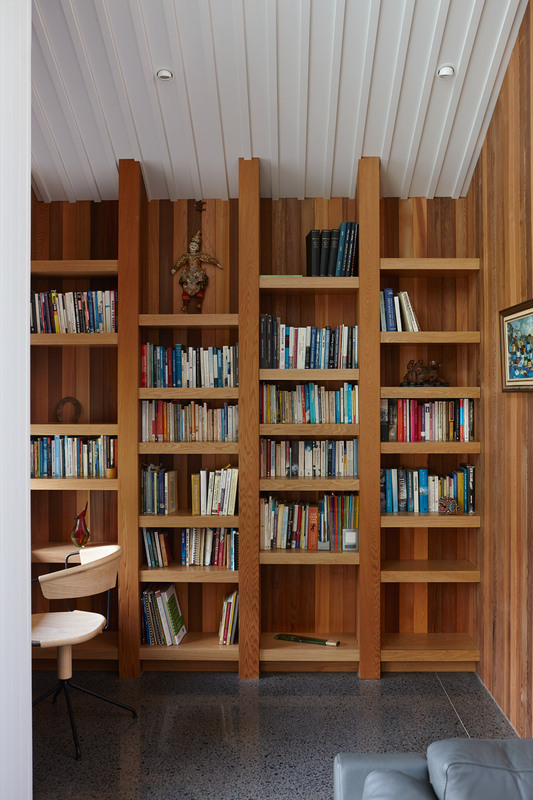 During construction there was endless speculation as to whether it might be a library or some other community facility. 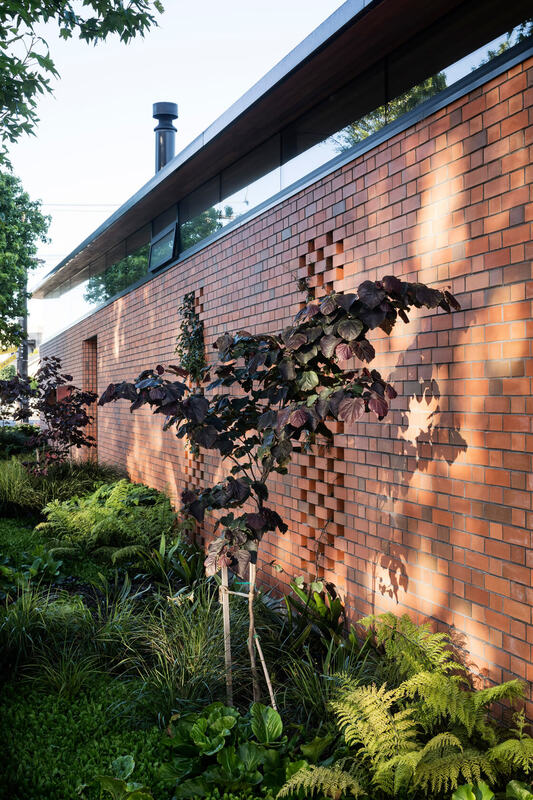 Now complete, it has been enthusiastically accepted, with people of all ages responding positively to both it and the surrounding gardens. 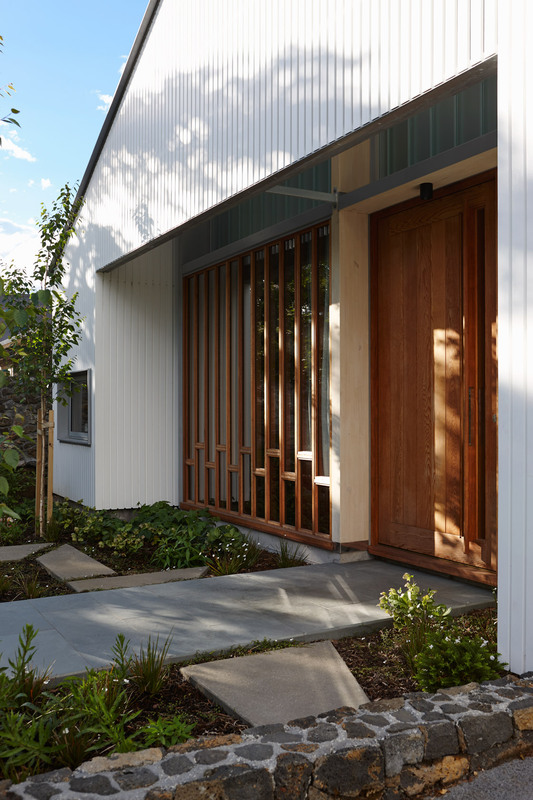 Situated in a quiet street lined with villas in the leafy suburb of Mt Eden, this modest house is a direct response to its context. 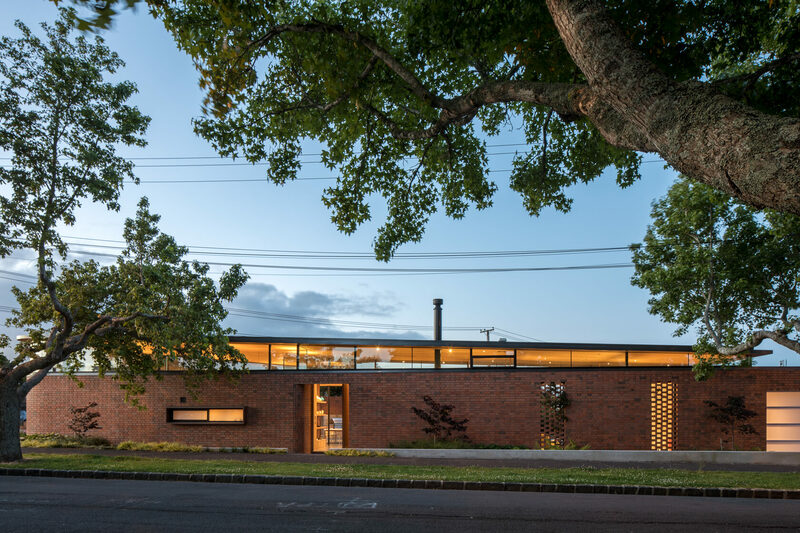 Driving the design was a desire to create a new house that respects the uniform setback and generally open front yards of its heritage neighbours. 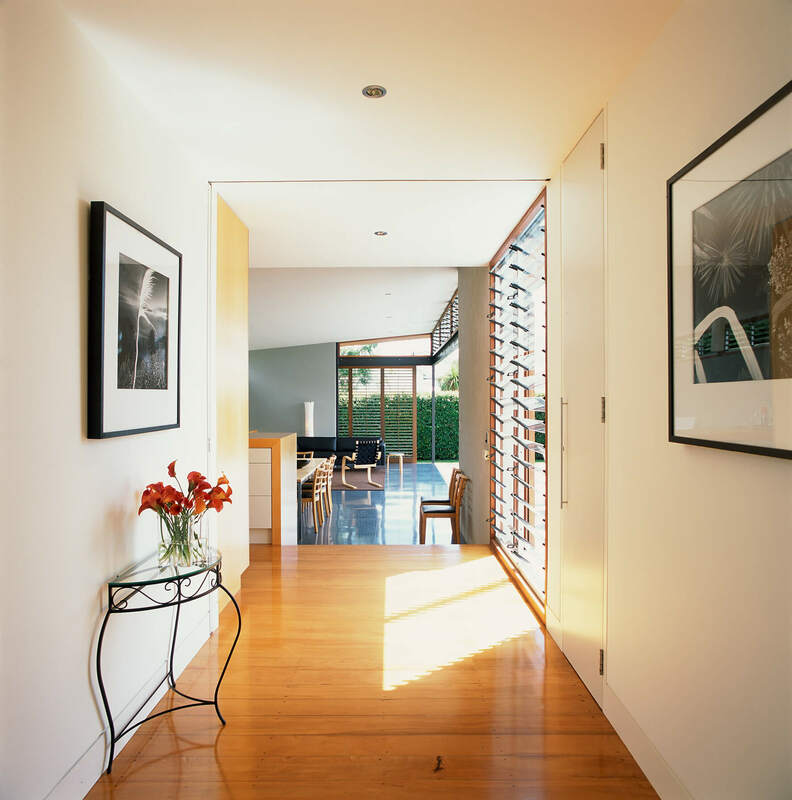 It was important that the house didn’t interrupt the scale and rhythm of the older houses surrounding it and that it had a clearly articulated entrance. 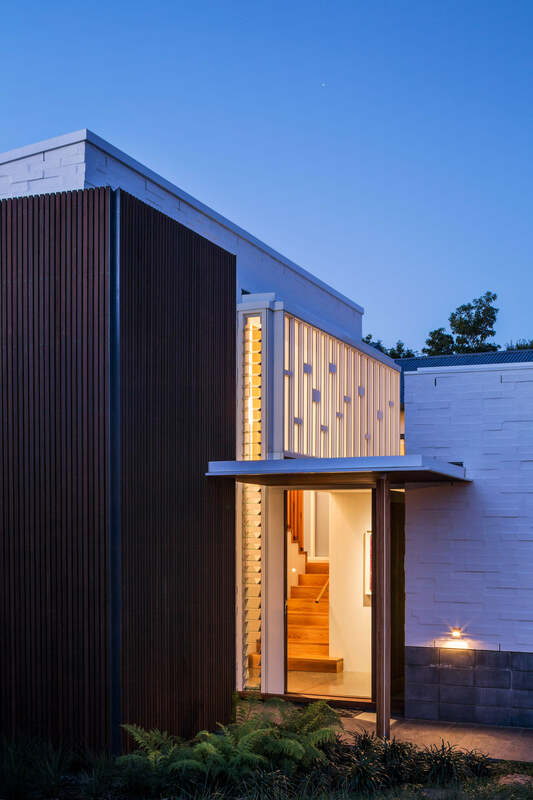 The resulting asymmetrical gabled form attempts to evoke a memory of the traditional verandah, albeit in an abstracted way, by carving out an entrance portico. 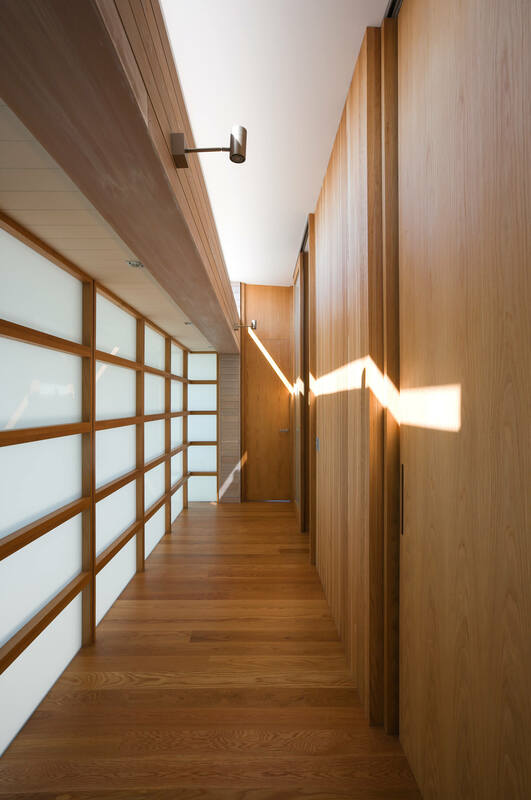 The relative transparency of the house in this area is intended to invite the street into the house and reinforce the notion of entry. 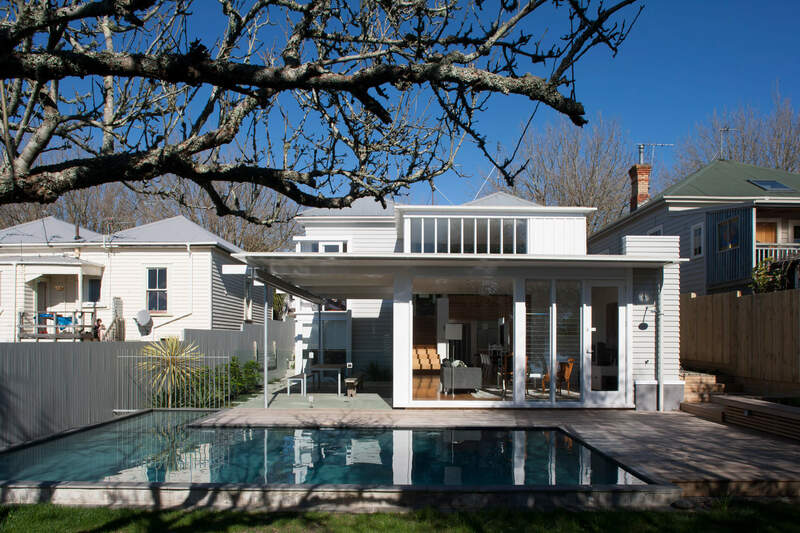 Through the planning process to gain consent to demolish the existing gabled cottage on the site council planners concluded that it made a quiet contribution to the street. 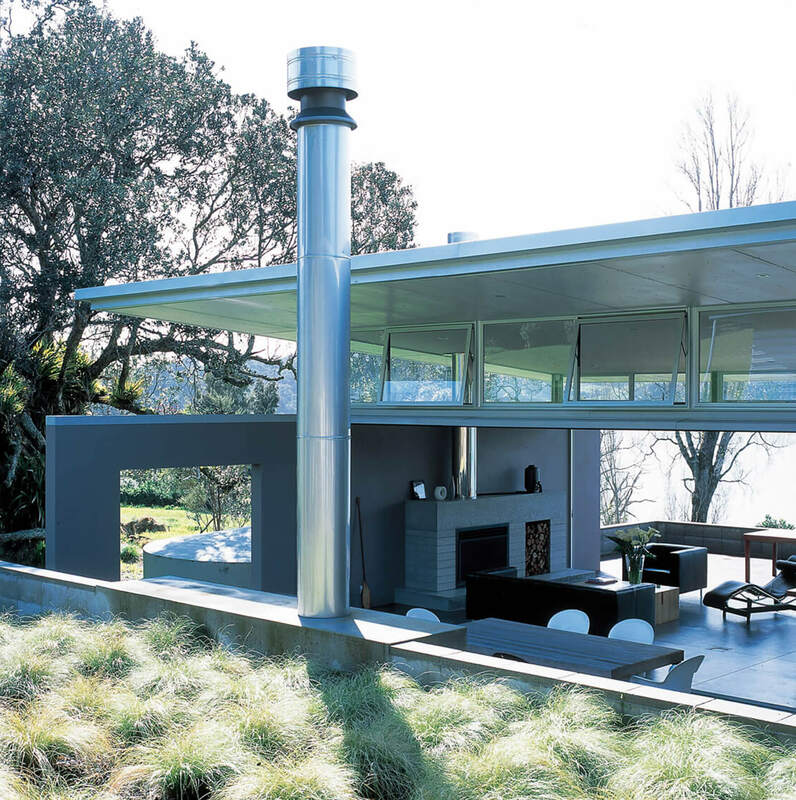 This was the ambition for the new house that replaced it. 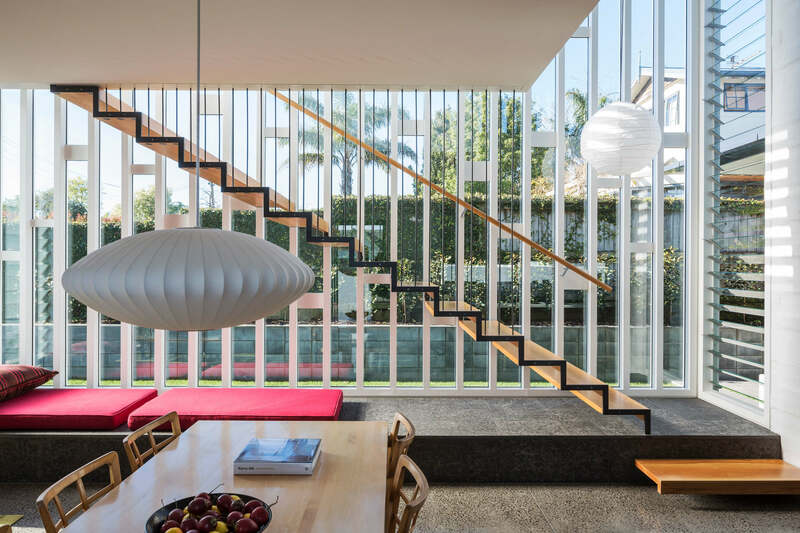 The design preserves the original house’s position on a slightly elevated plinth above the street, but intensifies that relationship with the street by being anchored to the ground rather than suspended above it. 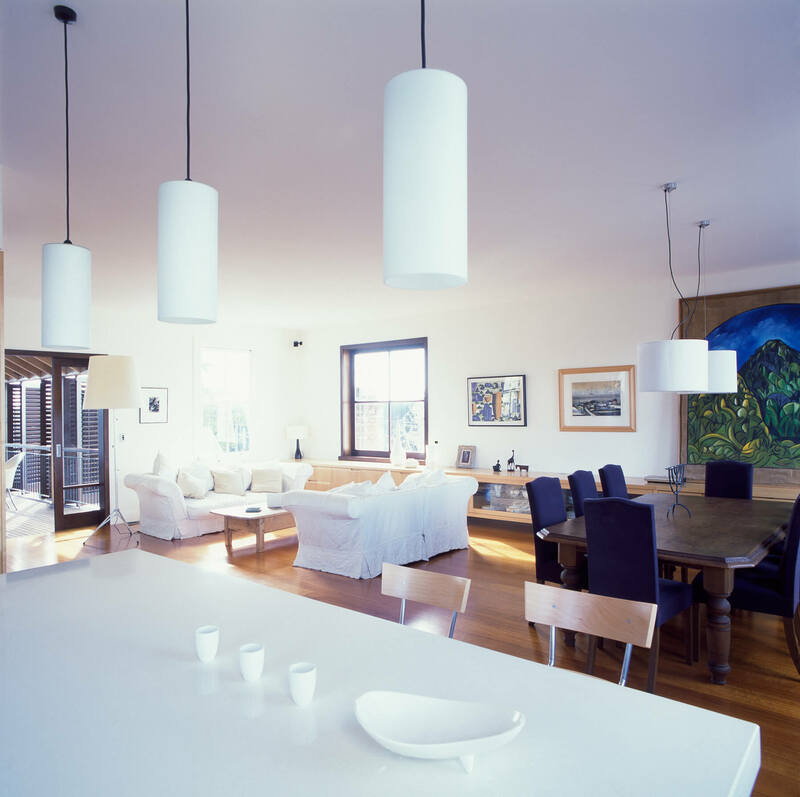 The clients are a recently retired couple who wanted a home they could share with their family, and especially their grandchildren. 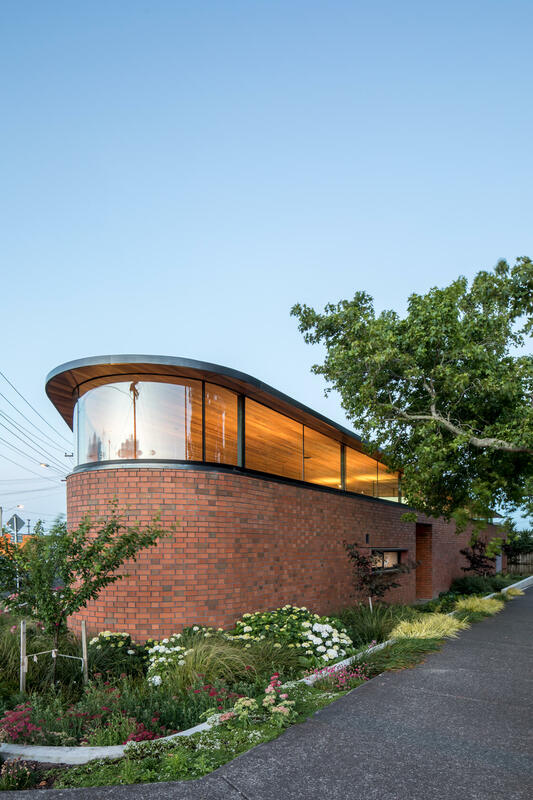 It was to provide them with a ‘lock up and leave’ living environment, and they were eager for it to be respectful of the street’s village-like atmosphere. 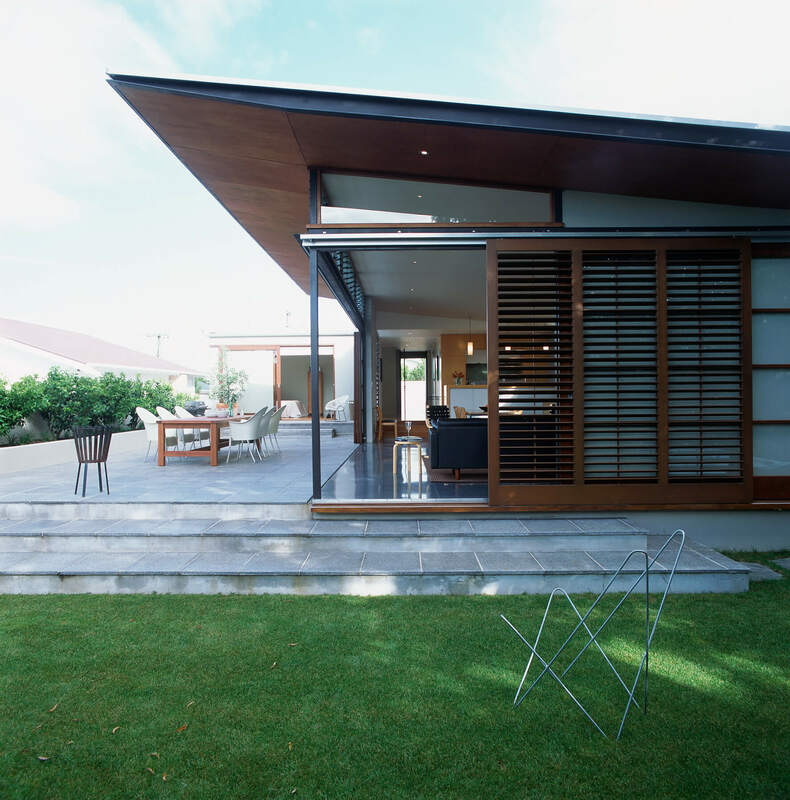 The irregular plot shape, with a right-of-way on its eastern side, provided the opportunity to mass the house on this boundary to allow an L-shaped plan around a north-west facing courtyard onto which downstairs living areas open. 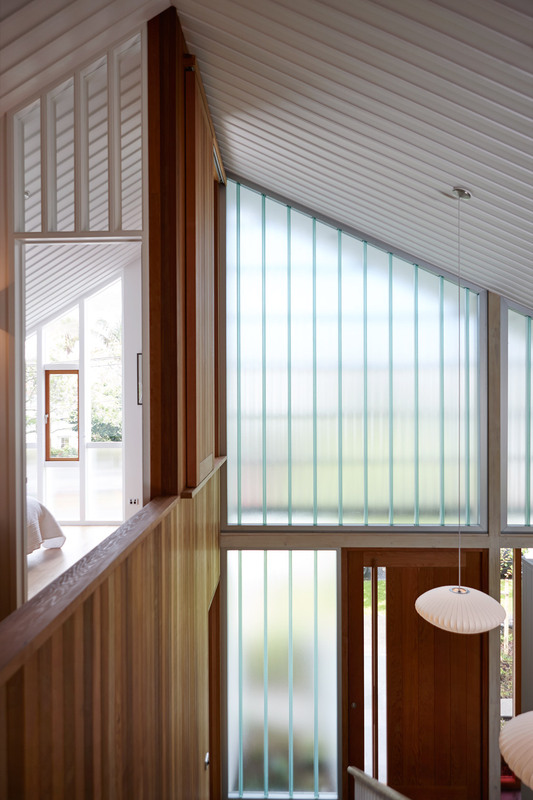 While the eastern side of the house rakes to follow the boundary a series of triangular projections are punctuated by north-facing windows that enliven the form and drag light into the centre of the plan. 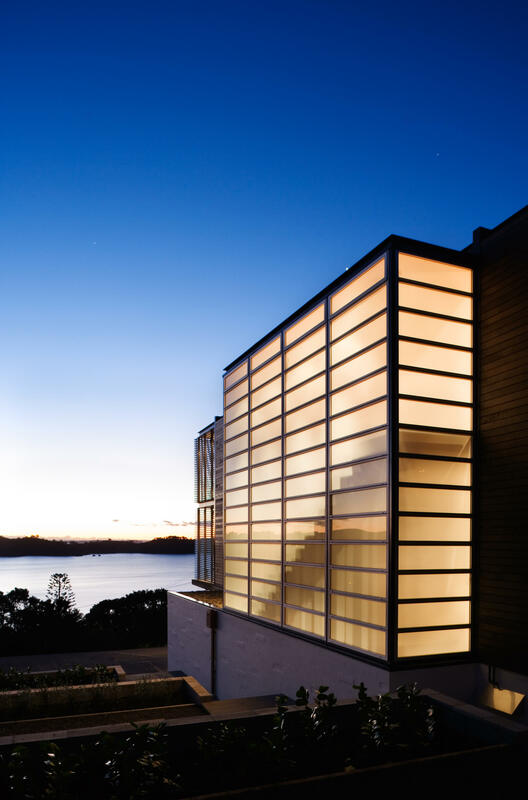 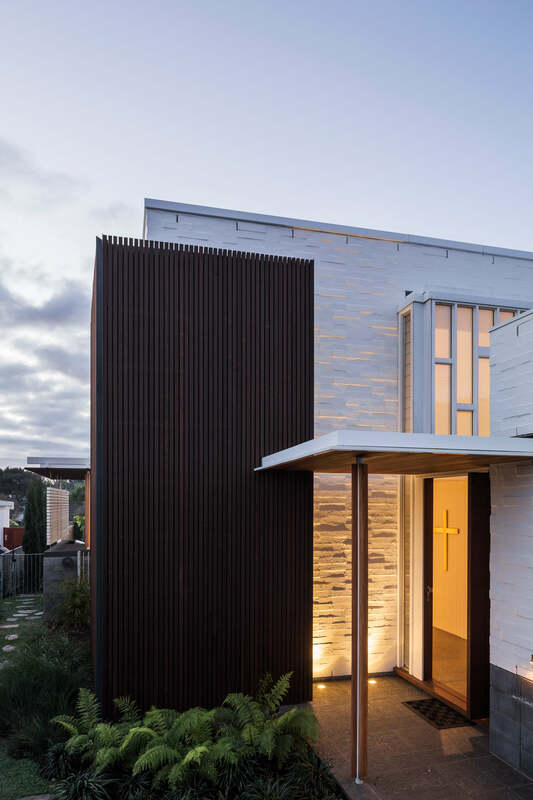 Double-height windows on the street boundary are partially screened and create a lantern effect at night, further reinforcing the new house’s engagement with the neighbourhood. 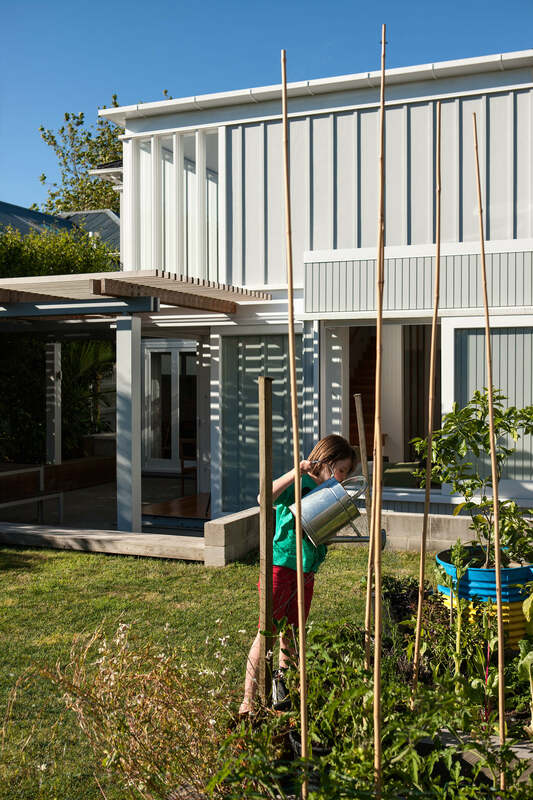 This inner-city family home nestles into a sloping, subdivided site in Grey Lynn, Auckland. 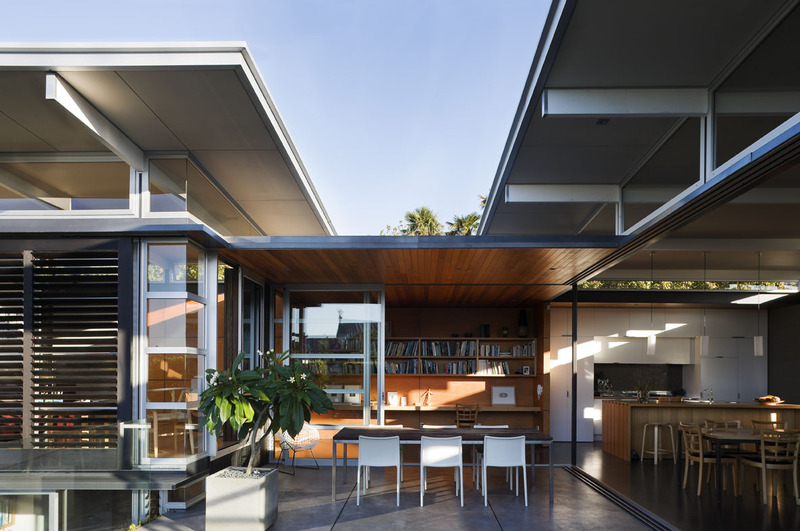 A simple L-shaped courtyard house, it is comprised of three principal volumes articulated by floating roofs − a garage and entry, a generous living, kitchen, dining space and bedrooms. 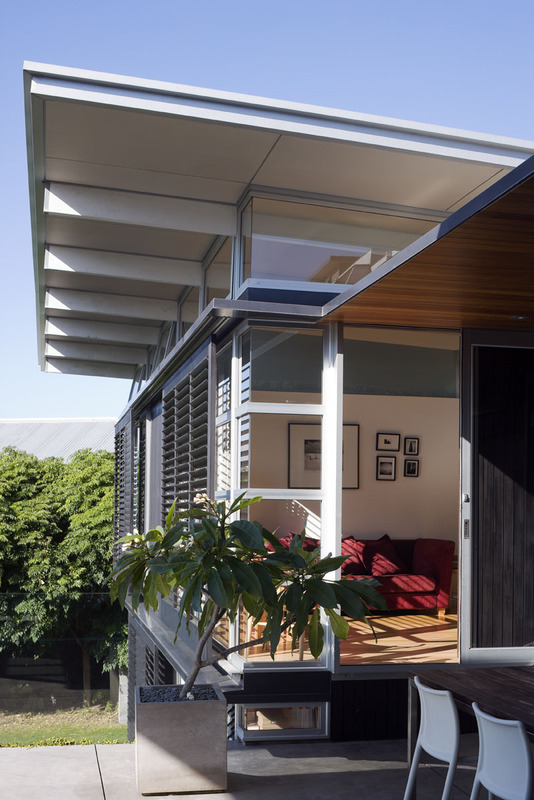 The upstairs living areas open to an elevated, north-facing courtyard while downstairs bedrooms lead directly to a sheltered garden. 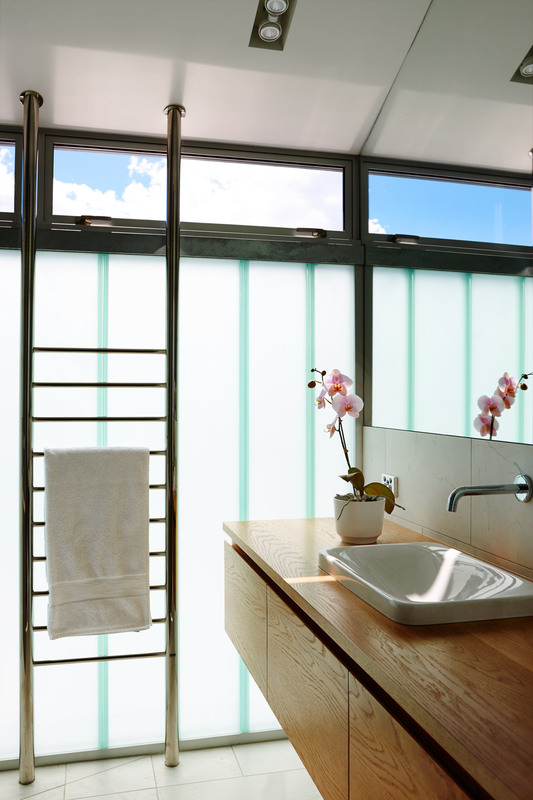 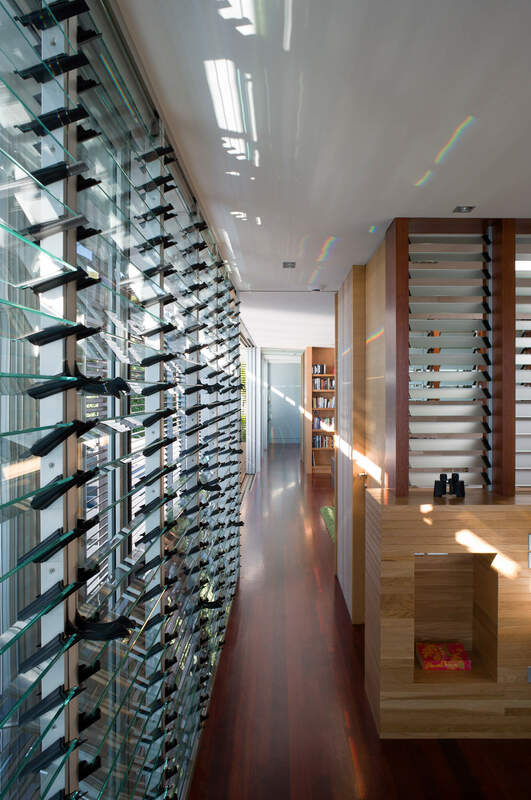 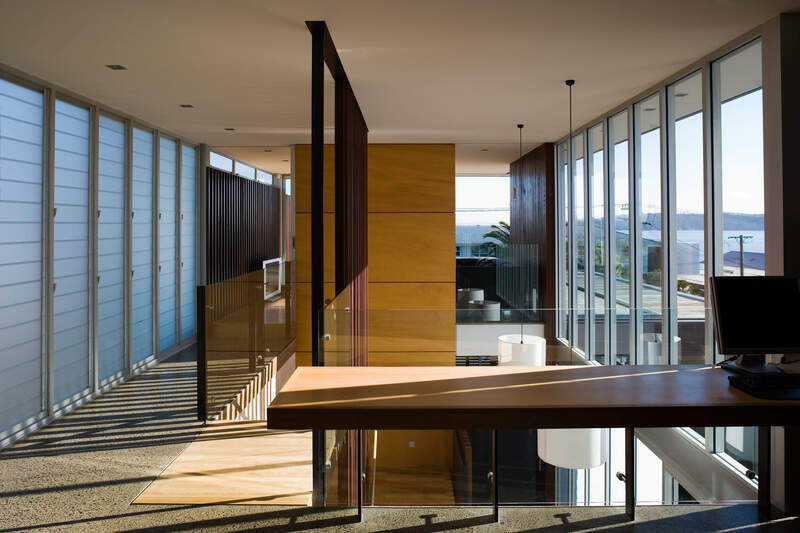 Moveable glass walls which enclose the living areas, maximising the house's northerly aspect, are contrasted with adjustable timber screens that lend privacy to bedrooms. 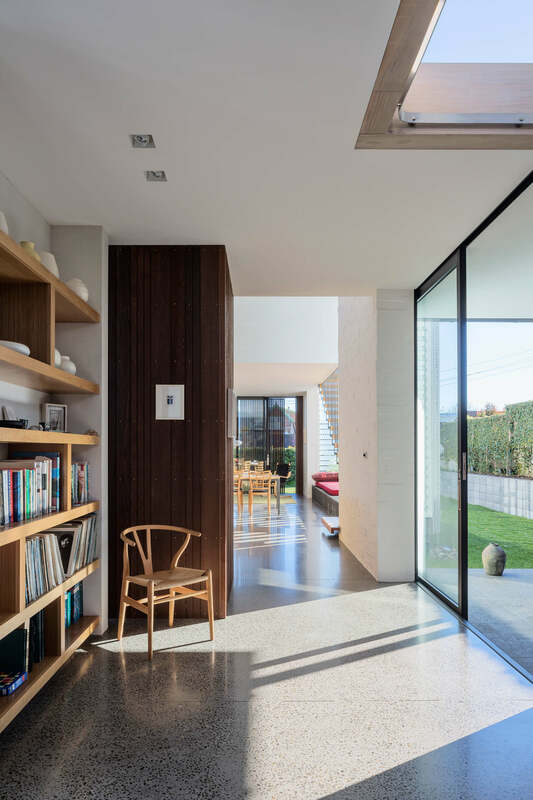 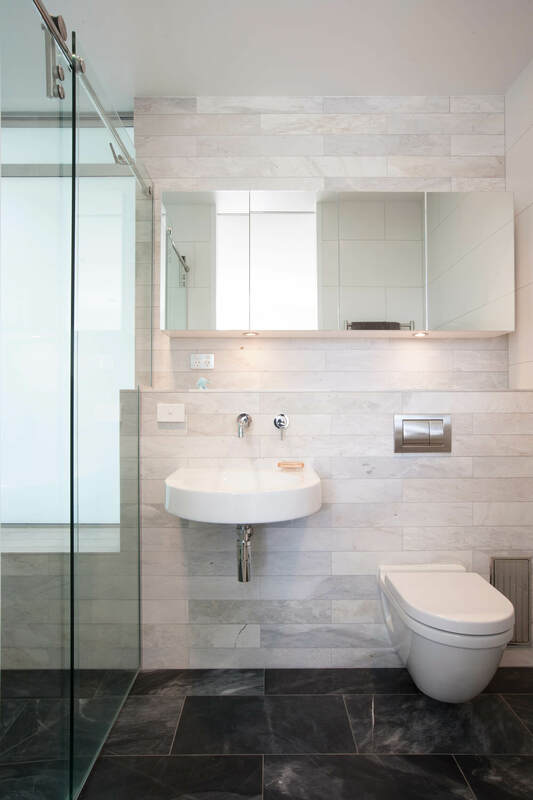 Inside, a restrained palette of materials − timber, stone and concrete block − add textural interest and warmth while complimenting the simplicity of the design. 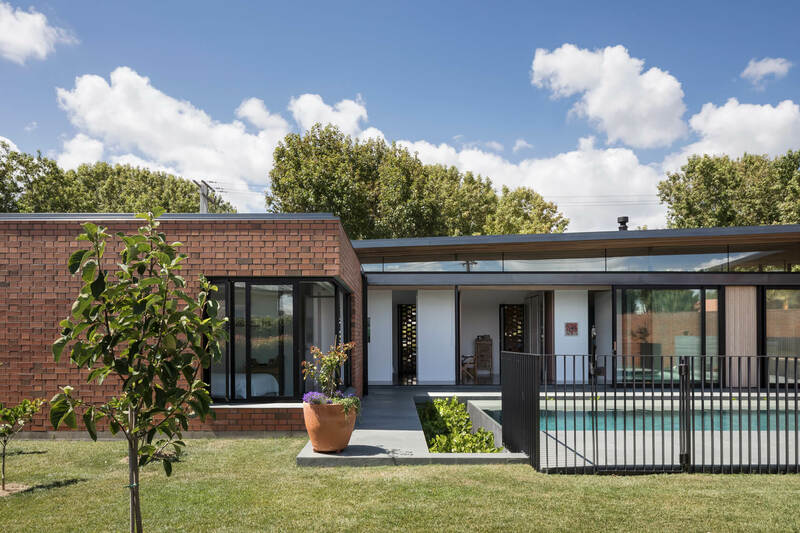 The plan of this family home on a long, narrow site in a dense suburban area was driven by a need for discrete separation for teenage children and a home office work situation. 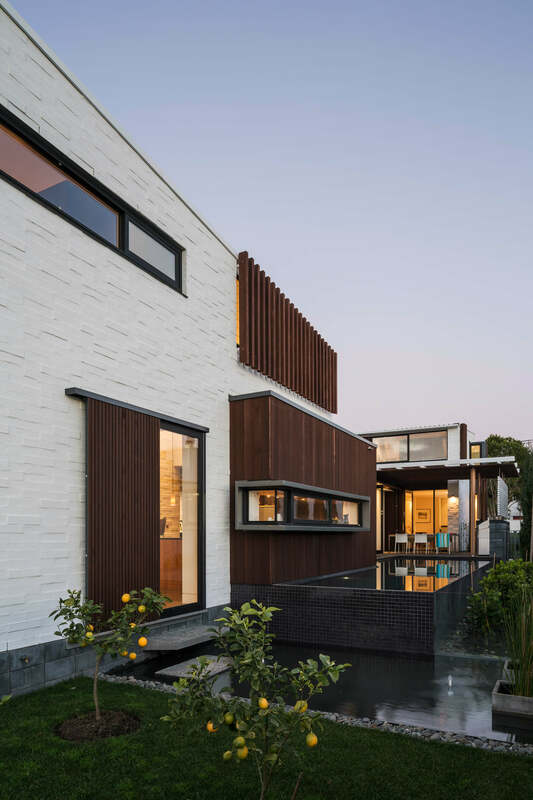 Side courtyards, including a west-facing pool, subvert the typical front to rear suburban yard typology. 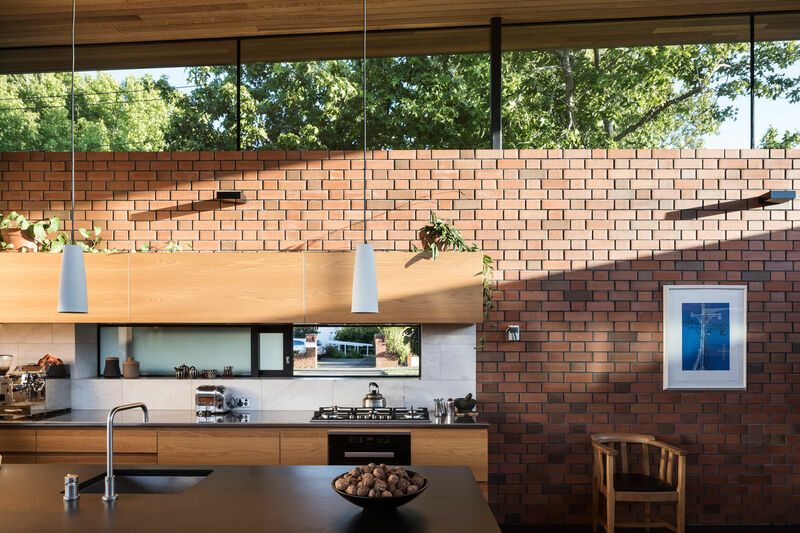 The generous kitchen, dining, living room and master bedroom are situated beyond neighbouring houses at the rear of the site to create better solar aspect and the opportunity to borrow views of surrounding gardens. 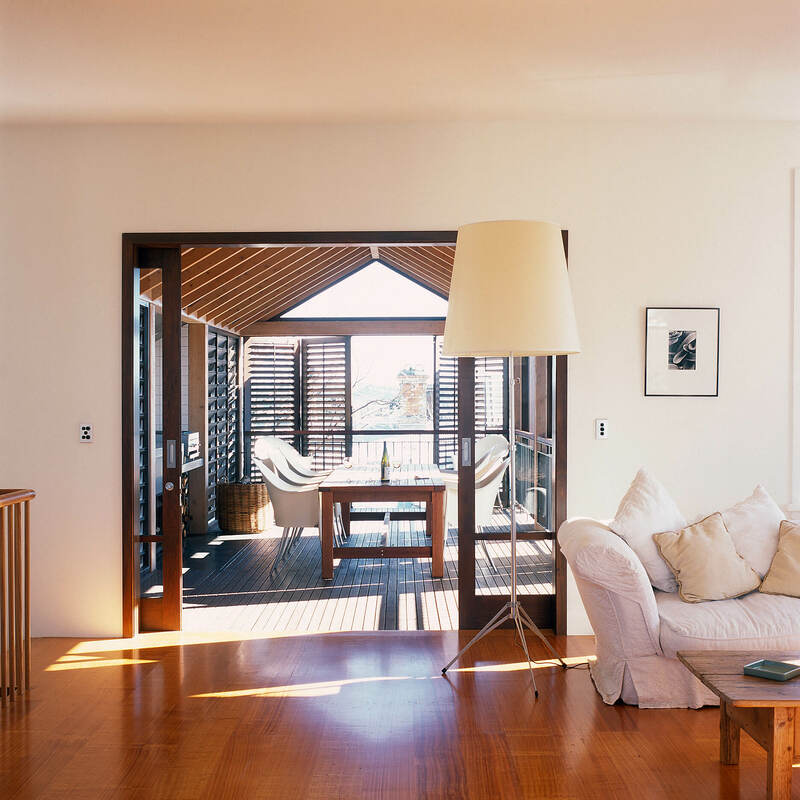 Children's bedrooms are acessed from the double-height entrance and are oriented to sea views and all day sun. 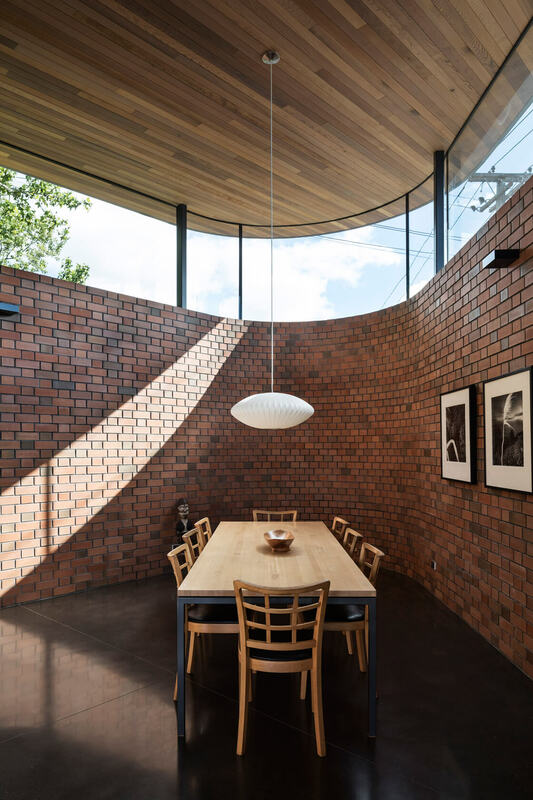 The decision to clad the house primarily in bagged brick laid in a cut and tuck configuration was, in part, influenced by the many brick houses around the neighbourhood, originally a traditional working class suburb. 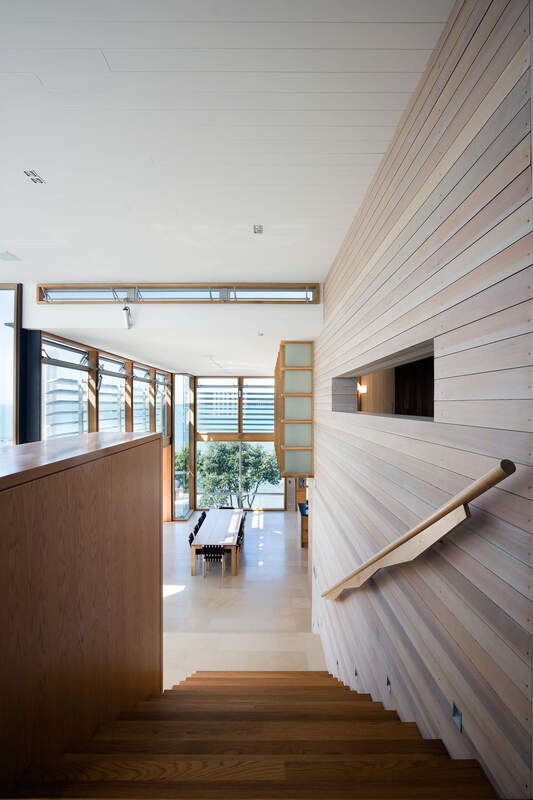 Vertical shiplap cedar weatherboards provide textural and colour contrast. 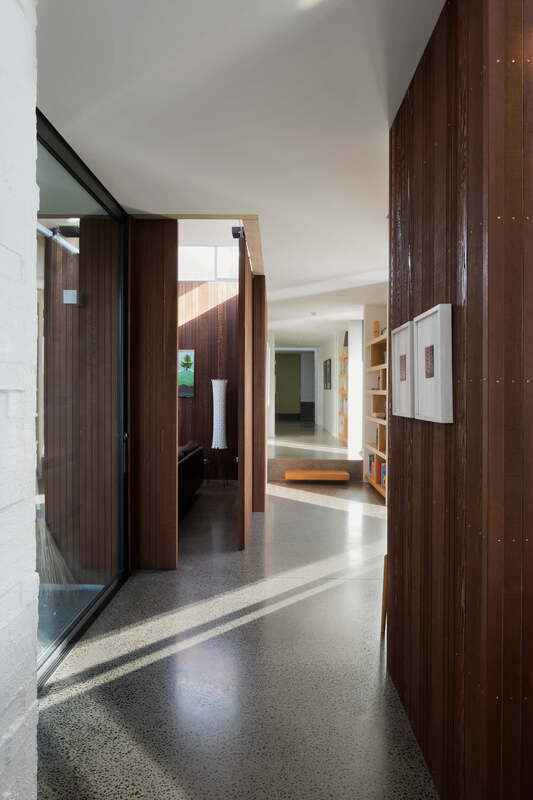 Exterior materials continue into the interior where possible to create textural richness and continuity with the outside, while detailing focuses on restraint and the clear articulation of individual materials. 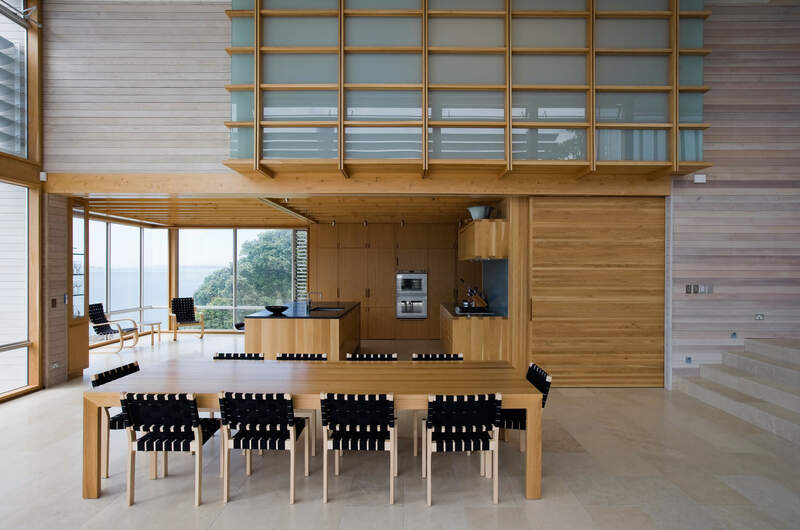 Conceived as a tent in the natural landscape, this house was designed to function as a holiday house and potential eventual permanent home. 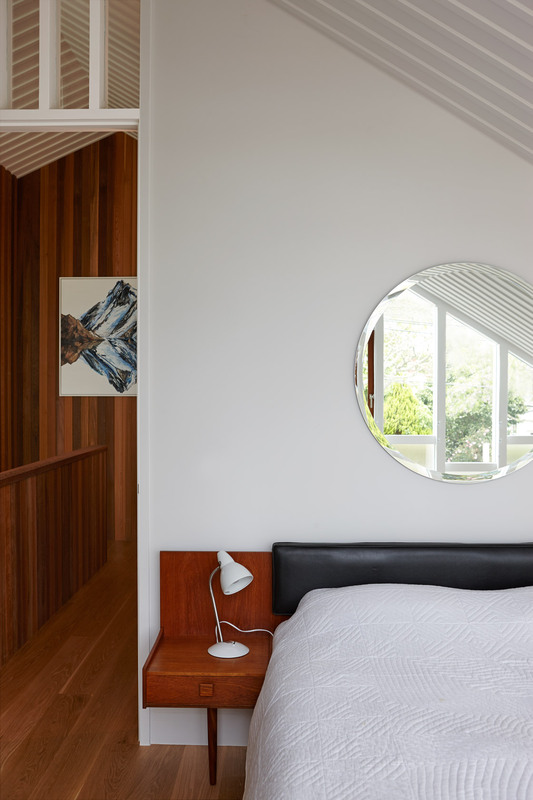 The client's brief for a flexible bach-like house led to a simple 'L' plan form, and allowed for conventional living arrangements to be subverted; bedrooms are separated from the main living volume by way of a covered entry that descends towards the water. 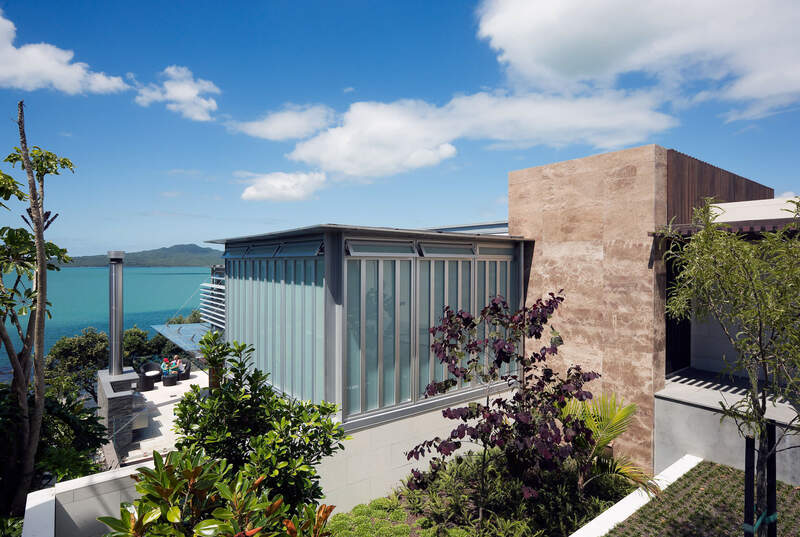 A protected western courtyard, which provides enclosure from the elements, is sheltered by the bedroom wing and the glazed living volume, which offers uninterrupted views to the estuary below. 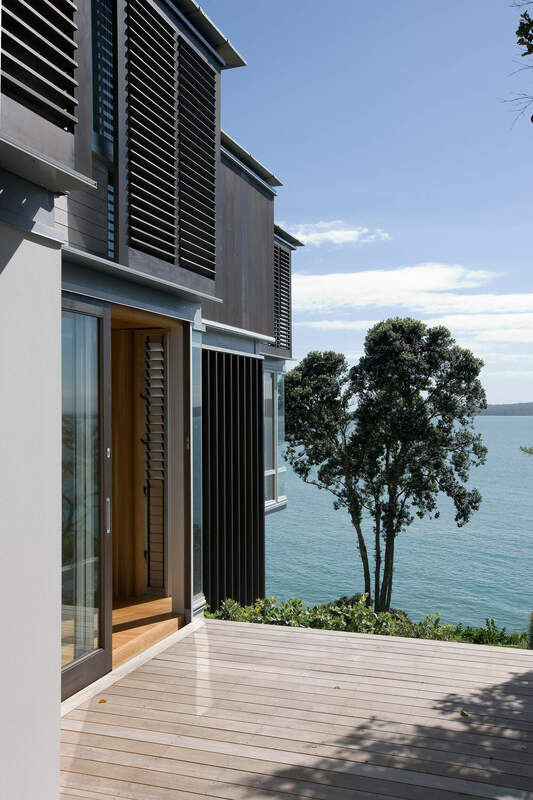 Bedrooms step back as they rise up the slope to also afford each room views of the water. 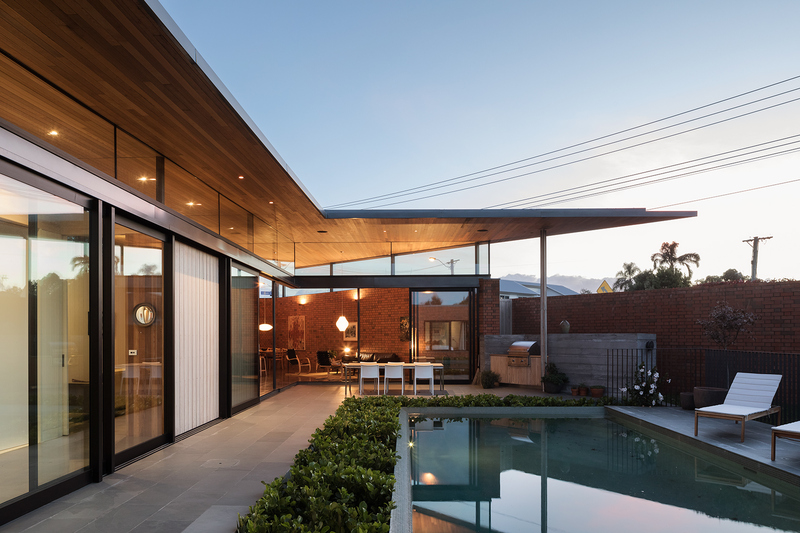 The solid base of the house contrasts with the hovering roof, which is supported on slender posts, creating a mix of permanence and fragility. 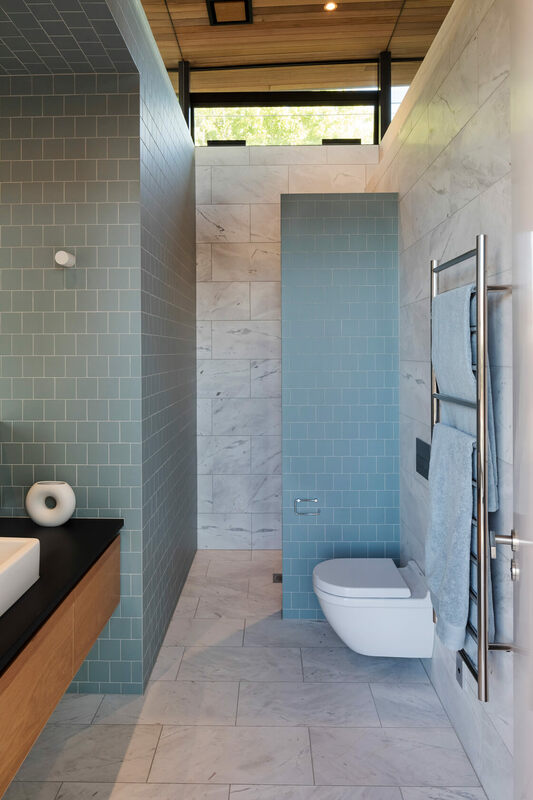 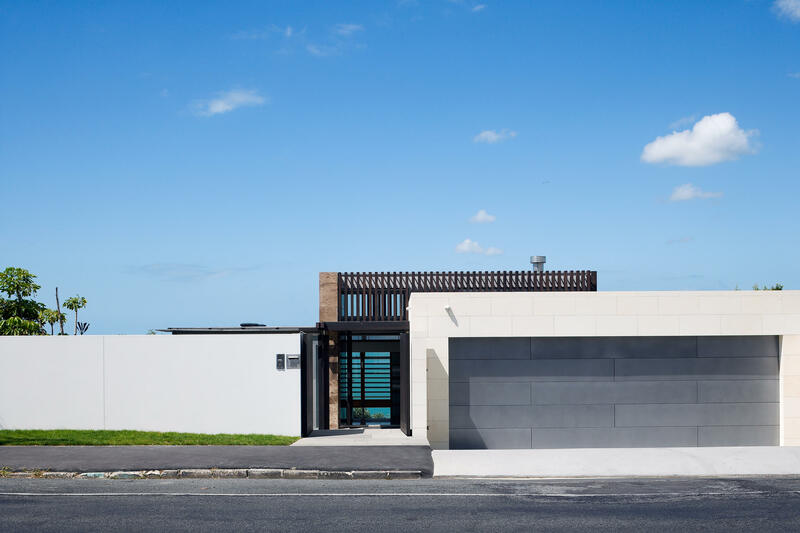 A restrained palette of low-maintenance materials is suited to the house's coastal location and the owners' desire to have a home they could 'lock-up-and-leave' and return to with minimal effort. 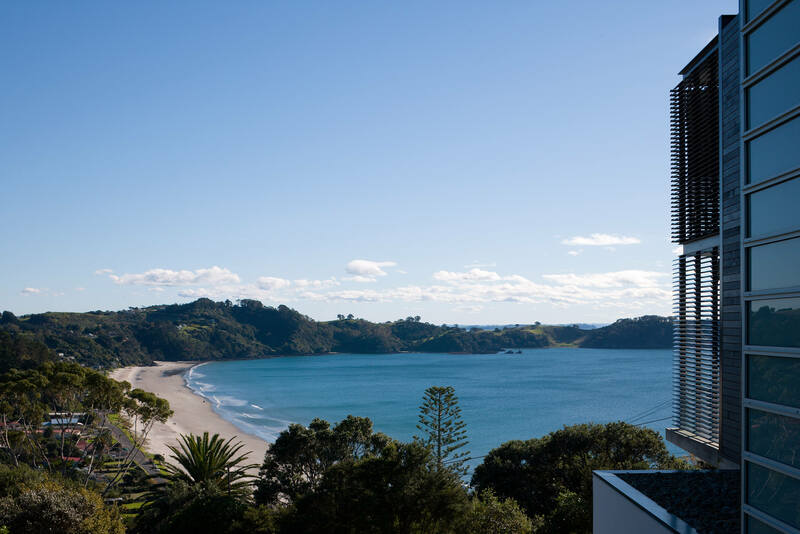 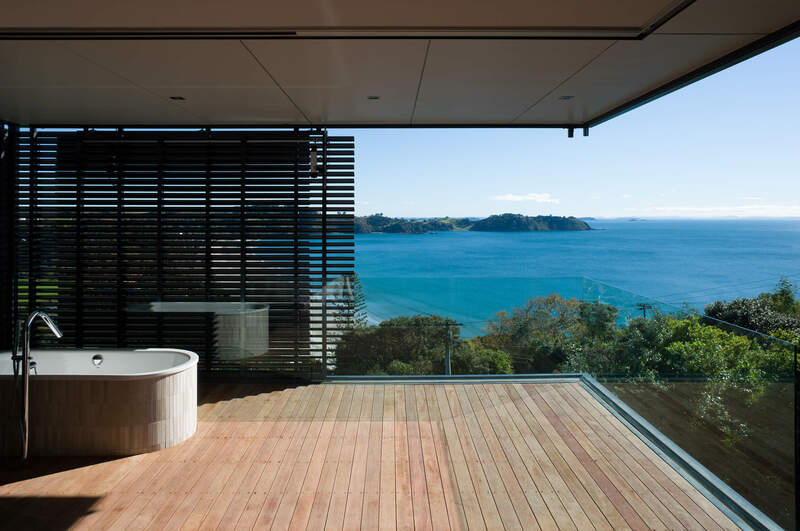 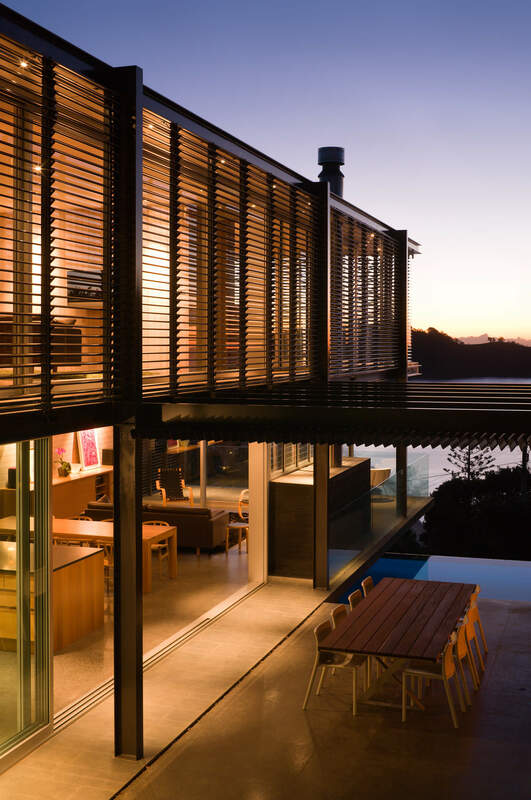 Located above Onetangi Beach on Waiheke Island this holiday retreat, with potential to evolve into a permanent home, is composed from a stacked arrangement of simple, semi-transparent forms evocative of a floating verandah. 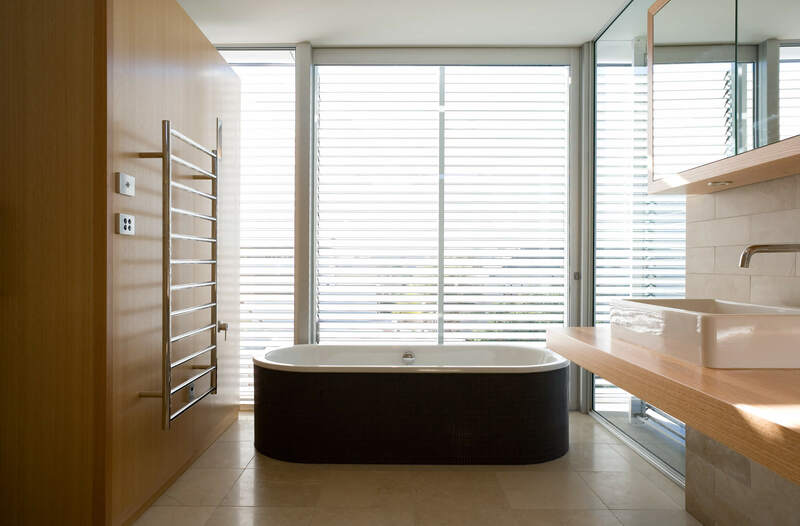 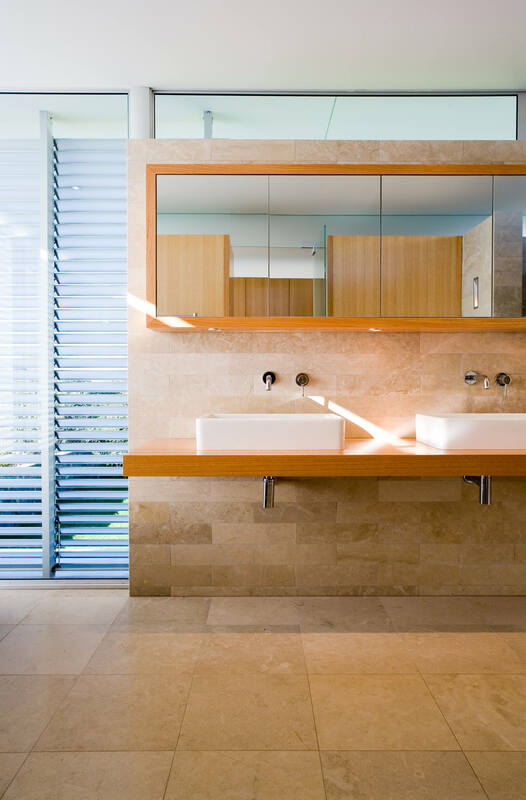 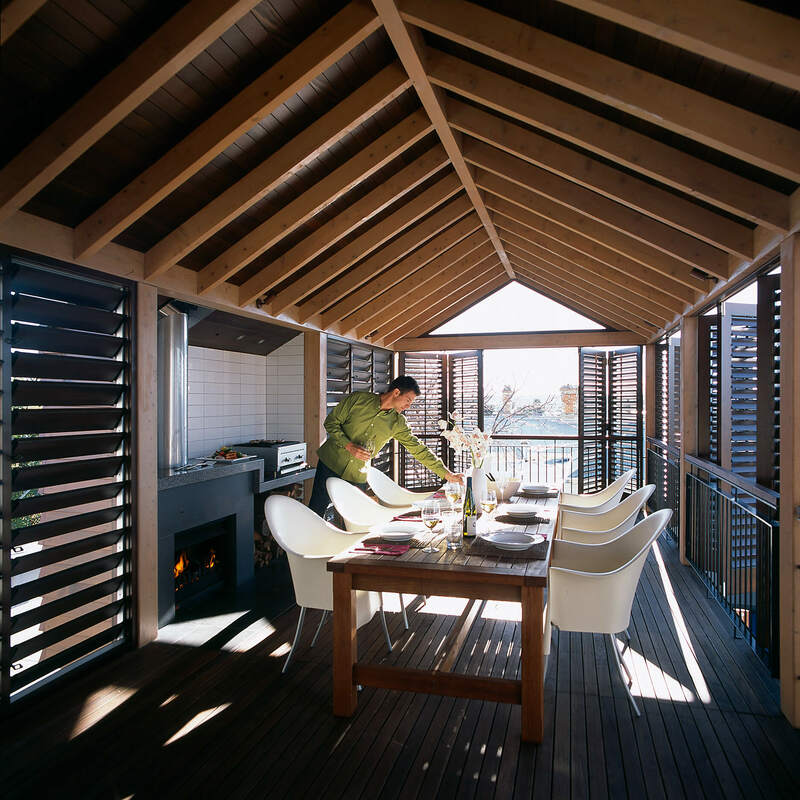 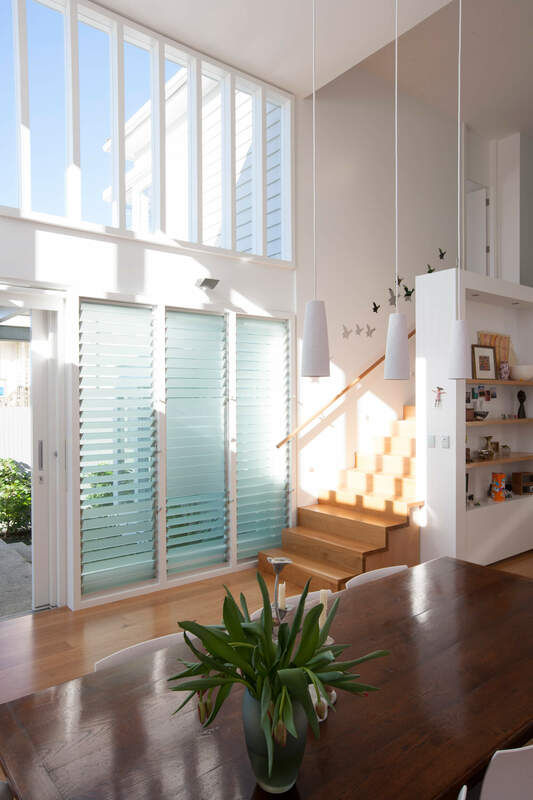 Sliding and tilting external louvres create opportunities to embrace or shelter from the elements, and also contribute to the series of layered spaces, including an outdoor room opening off the master bedroom complete with open-air bath. 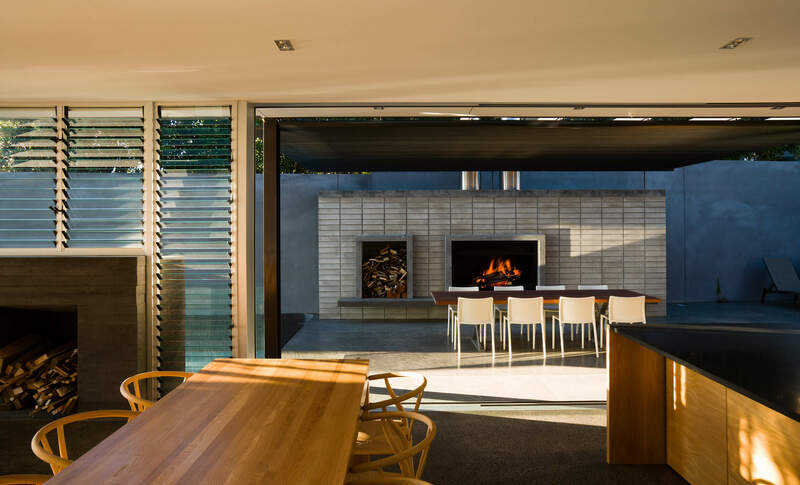 Kitchen, dining and living areas lead to a courtyard terrace carved out of the site that is shaded by louvres and shielded by the form of the house from westerly winds, and where an outdoor fire becomes the focus of evening gatherings. 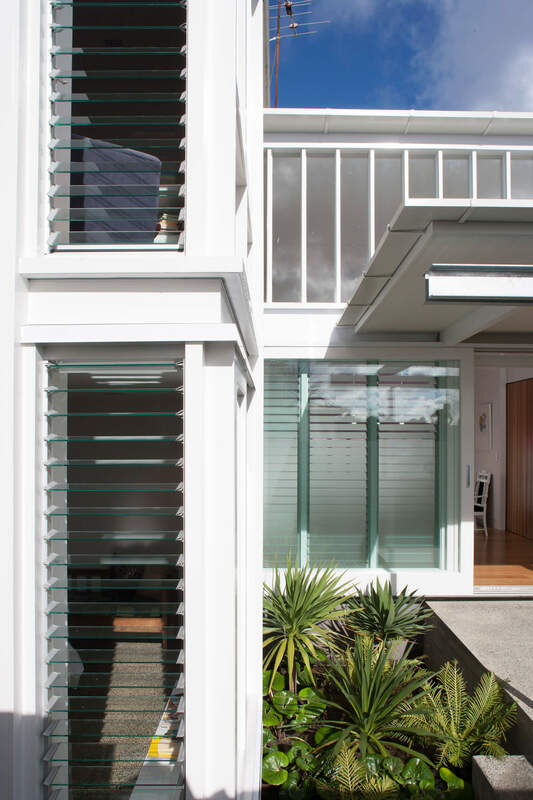 Upstairs bedrooms are located either side of a central lounge that doubles as an office kept cool by a breezy wall of glass louvres. 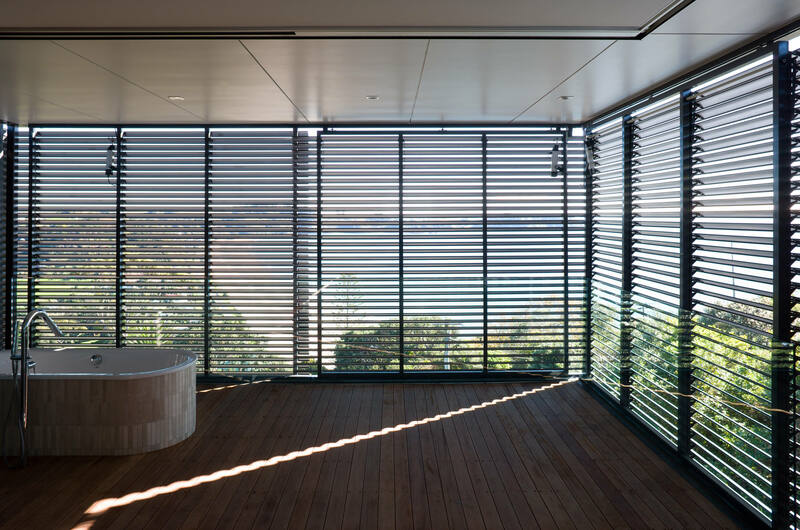 Here, too, external screens create an atmospheric layering of light and shade, and add to the endless possibilities for engaging with the view. 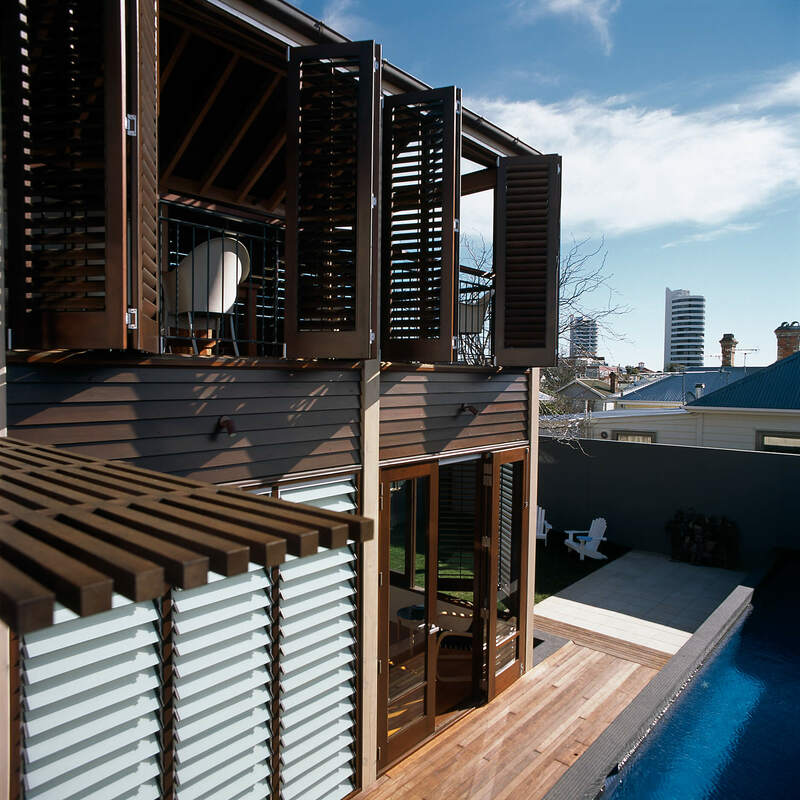 Suspended above a quiet seaside street, the floating terrace at the front of this home forms an outdoor room enclosed by timber screens that moderate privacy and openness to the neighbours. 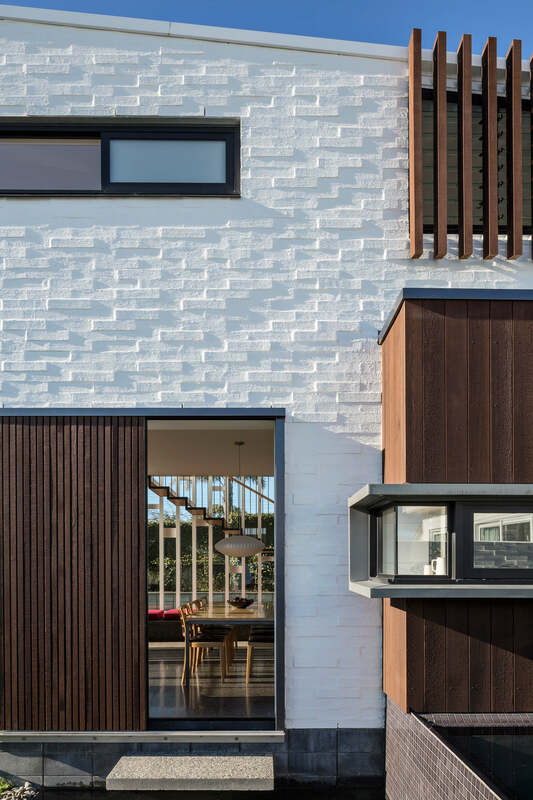 Living areas are located at the front of the house, with a bedroom wing enclosing the north-facing rear garden and shielding outdoor living areas from potential development on a neighbouring site. 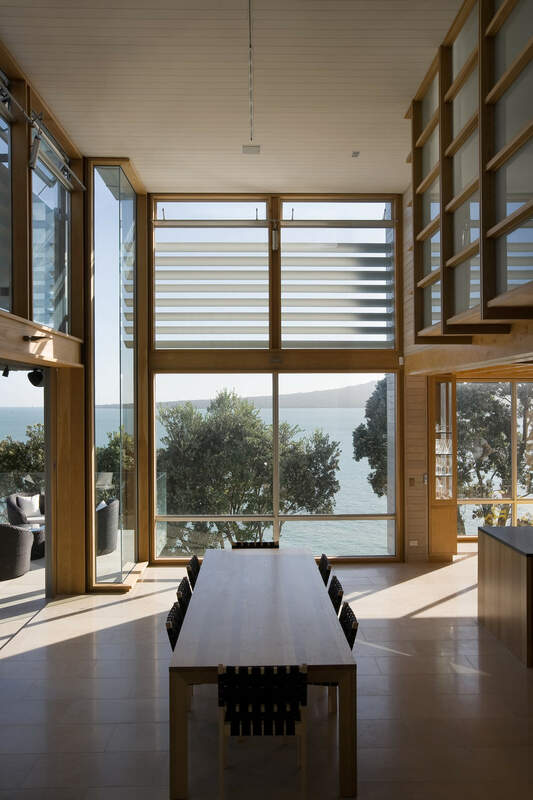 An upstairs office overlooks the atrium entrance and rewards occupants with an expansive sea view through generous glazing. 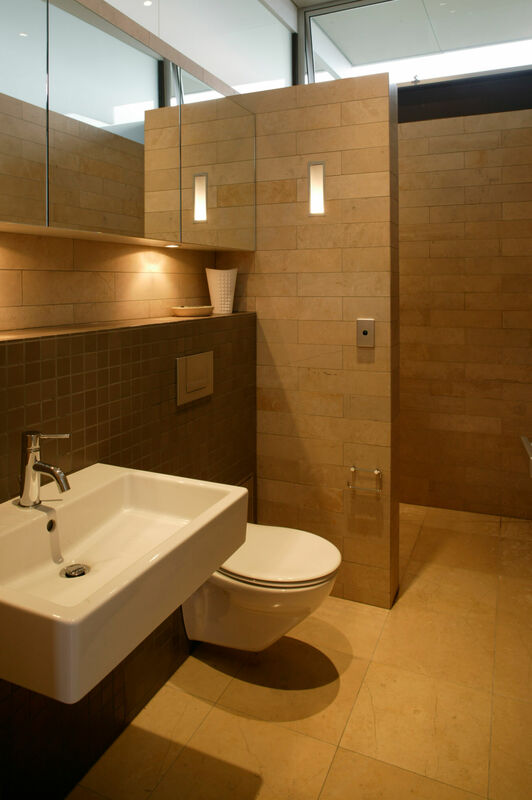 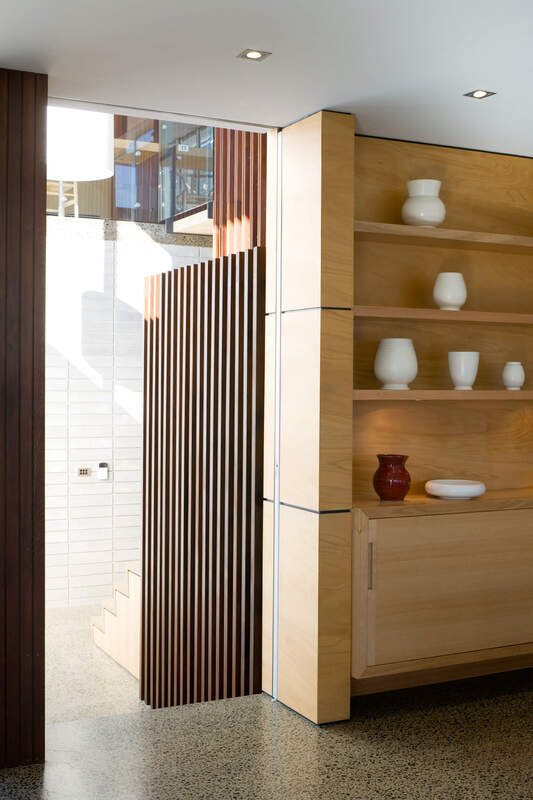 Inside, spaces are elegantly crafted from a refined and carefully chosen palette of natural materials. 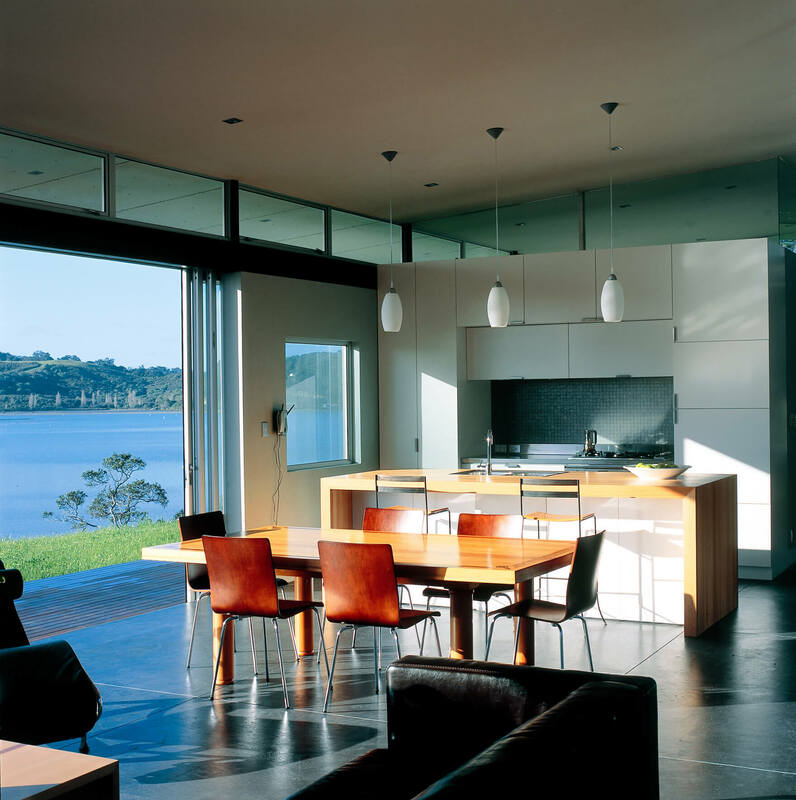 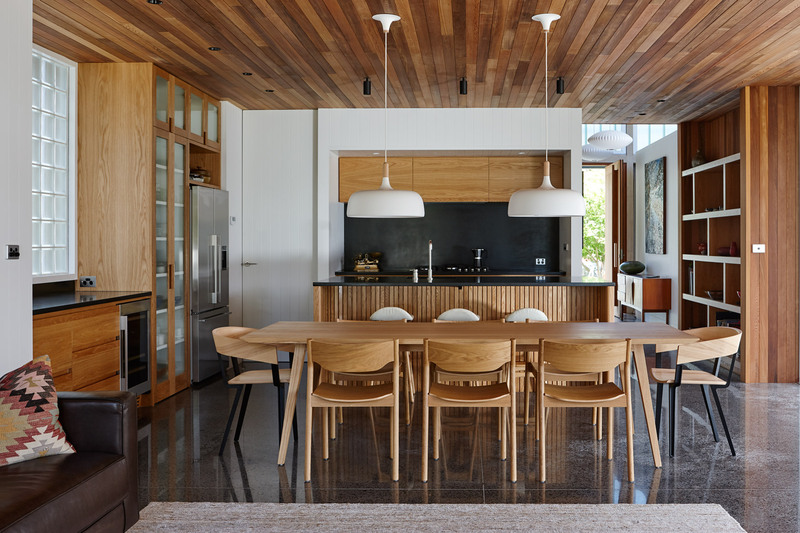 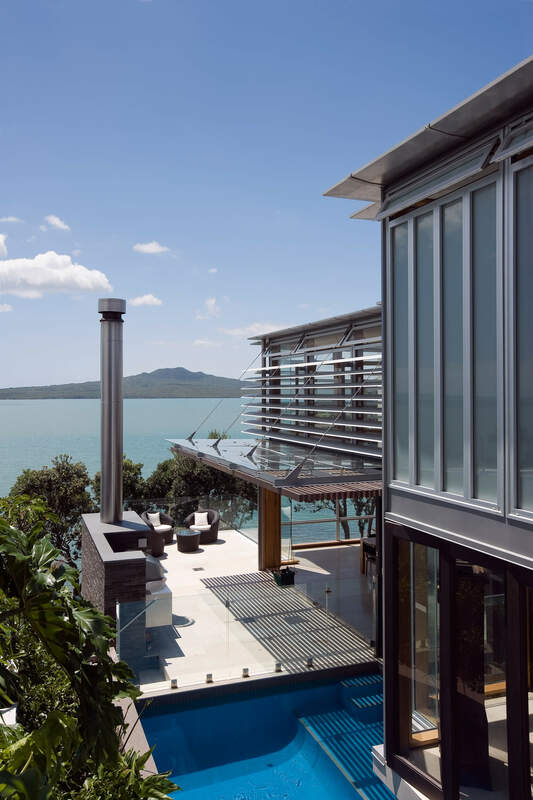 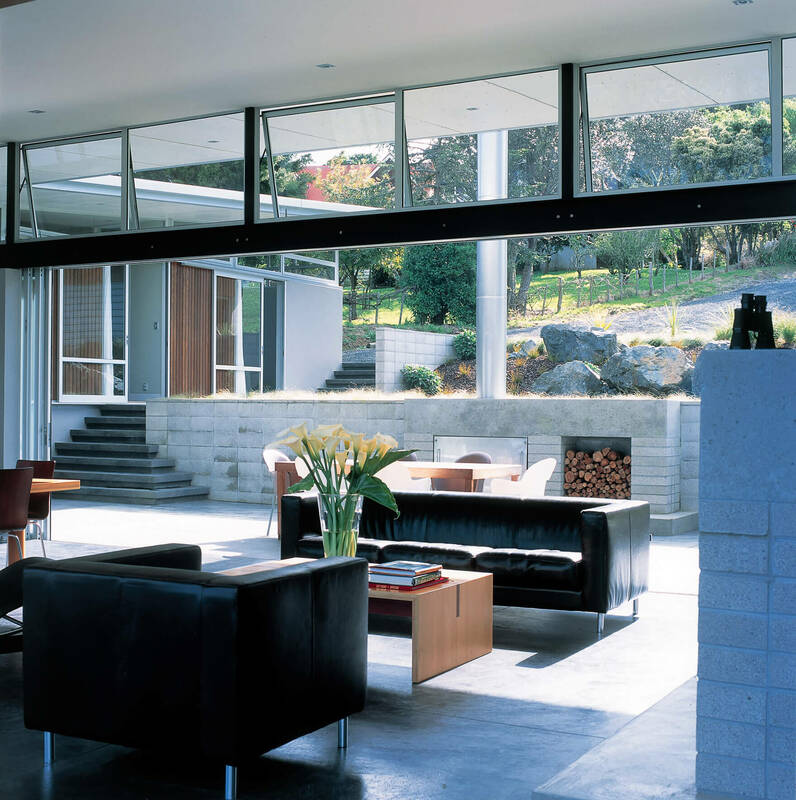 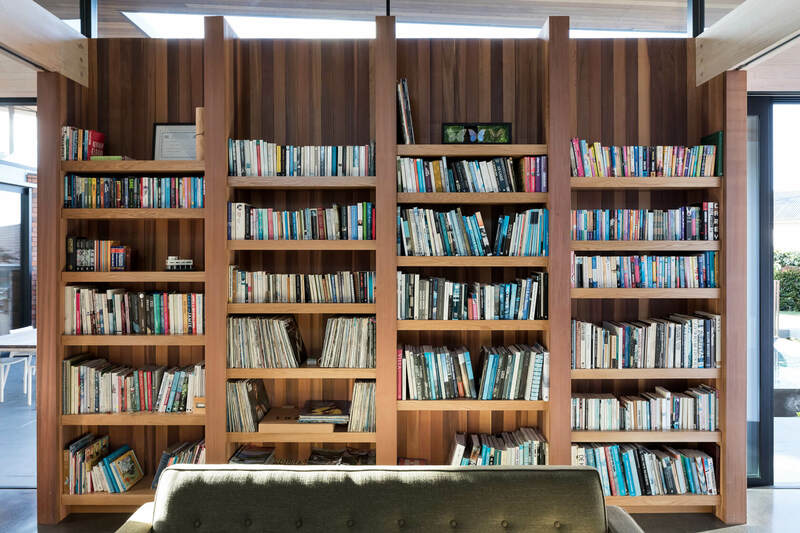 Designed in collaboration with Marshall Cook, this award-winning home tumbles down a challenging yet spectacularly beautiful site overlooking the Rangitoto Channel. 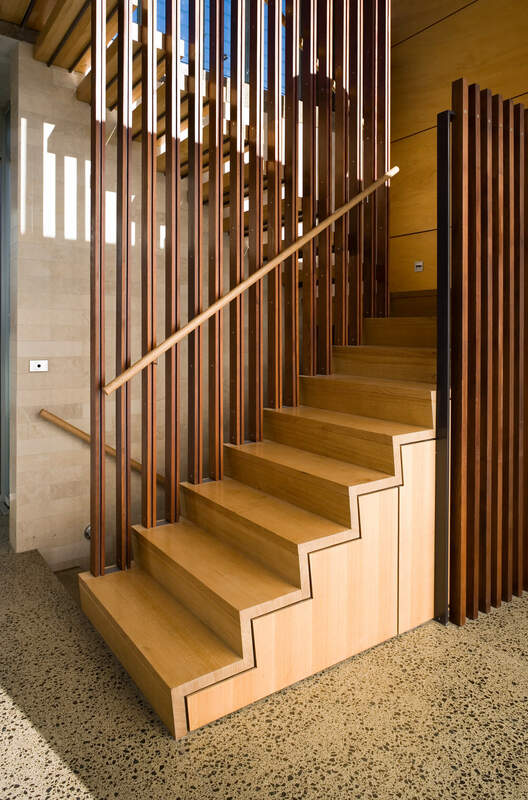 From the street level entrance a generous stair concentrates views on the dramatic seascape beyond the glazed double-height living-dining volume. 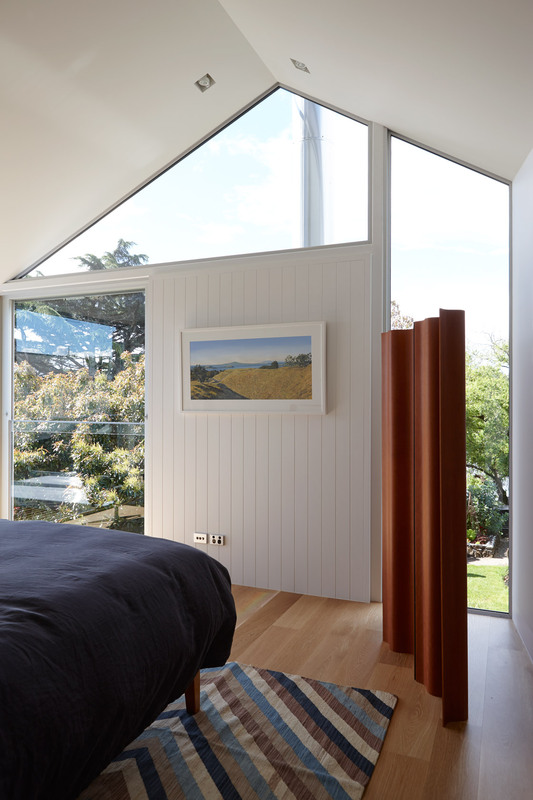 Upstairs bedrooms are articulated as an internal streetscape that further focuses views through the house. 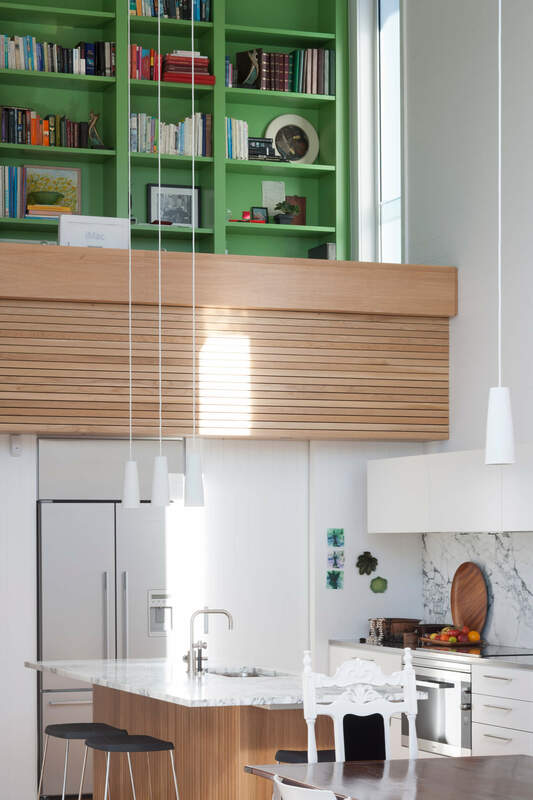 The kitchen, an adjoining sitting area and a separate night lounge are carved out from beneath the upstairs bedrooms, the change in ceiling height adding to the internal spatial drama. 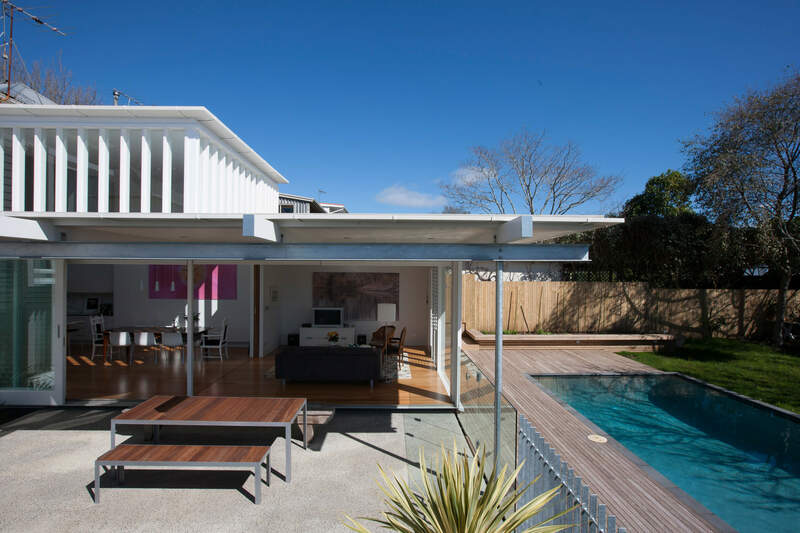 All three spaces can be independently concealed behind a sliding timber wall, while a level change defines an adjacent children's play area overlooking a pool and terrace. 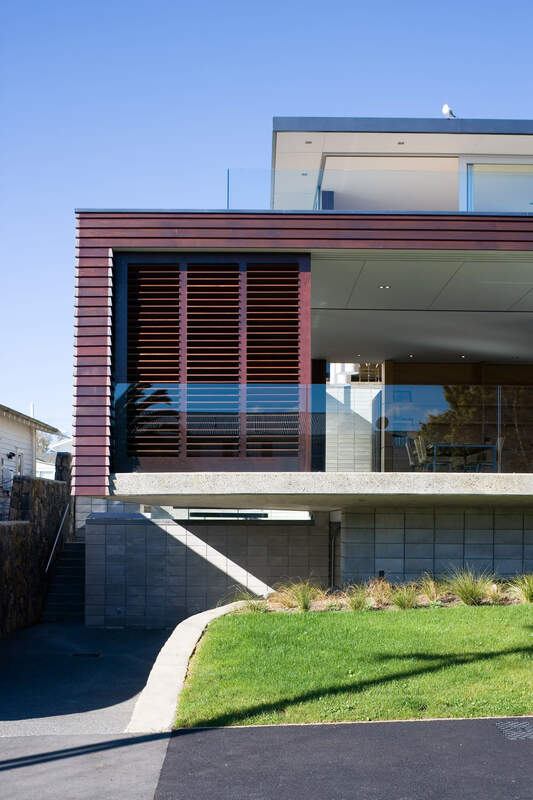 A rich palette of materials has been intricately crafted to create an elegant piece of architecture. 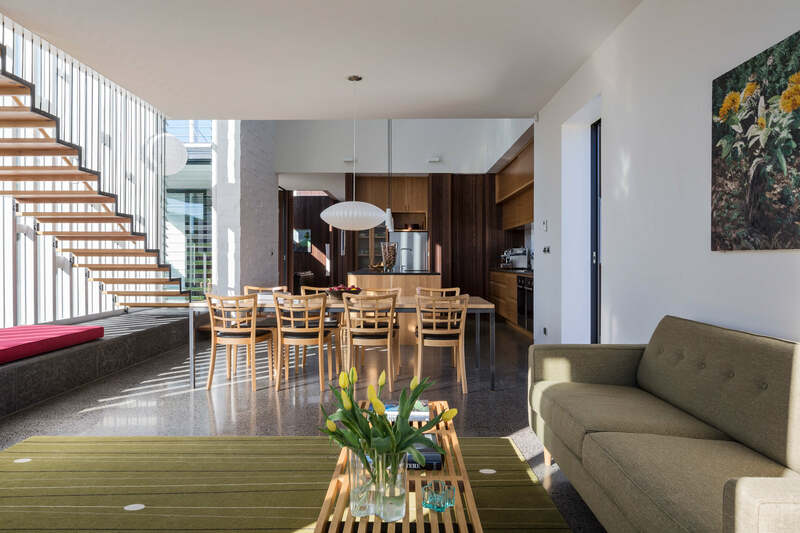 A villa in a heritage zone, this house offered challenges typical of many houses of its type. 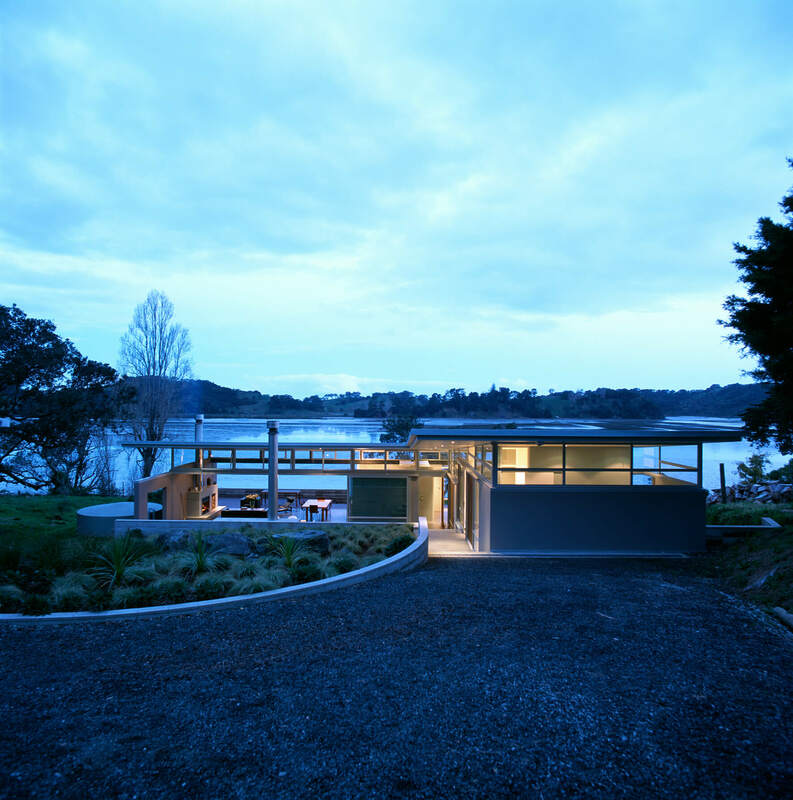 While the rear of the site has a favourable north-west orientation, the existing house was marooned two metres above the ground. 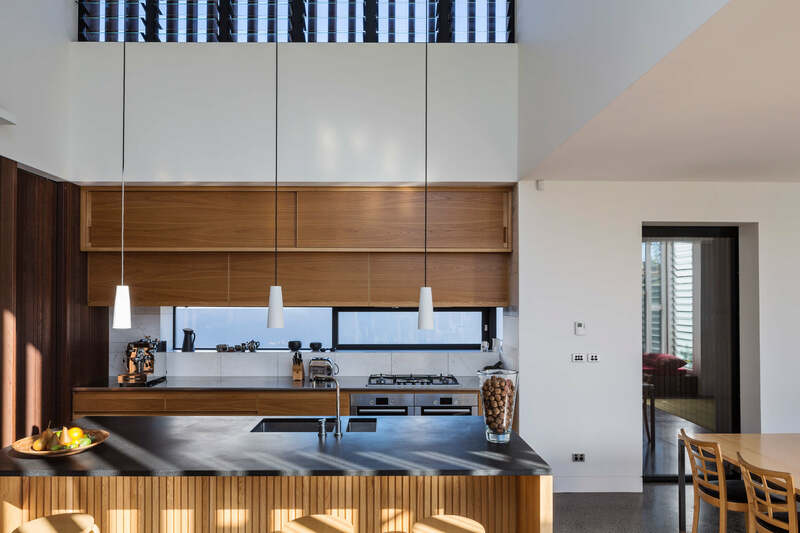 By carving away about a quarter of the villa's existing floor plate, a new double-height kitchen and dining space was created opening to the garden and a new pool. 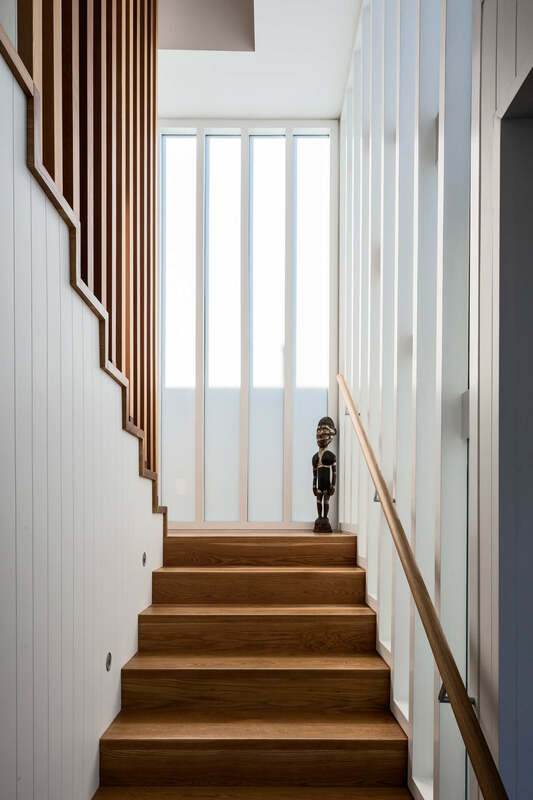 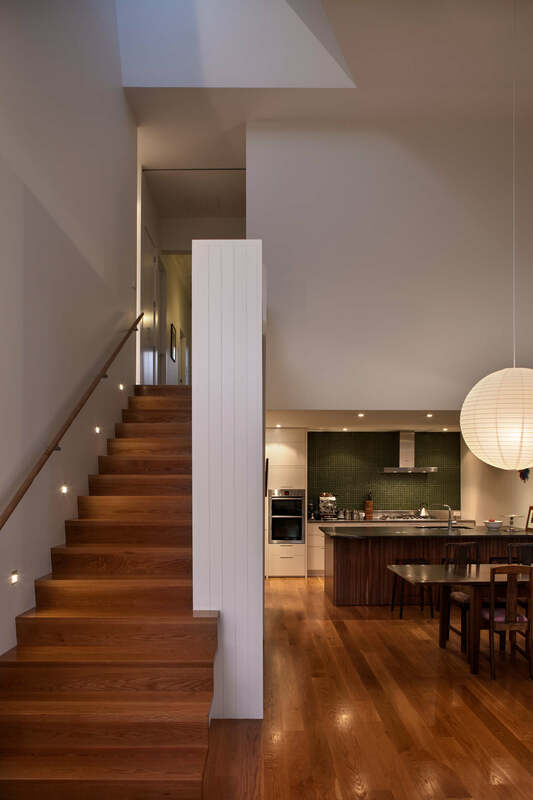 This new grounded volume also accommodates a generous stair which provides the opportunity for repose before descending from the original house. 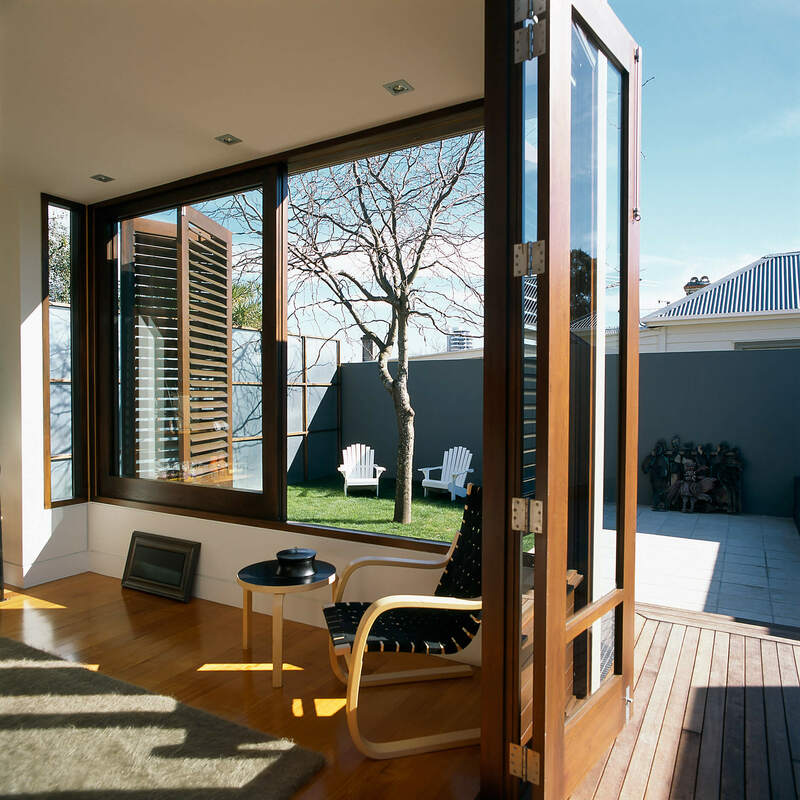 Connecting to the rear of the house, a single-height living area can be concealed behind sliding panels. 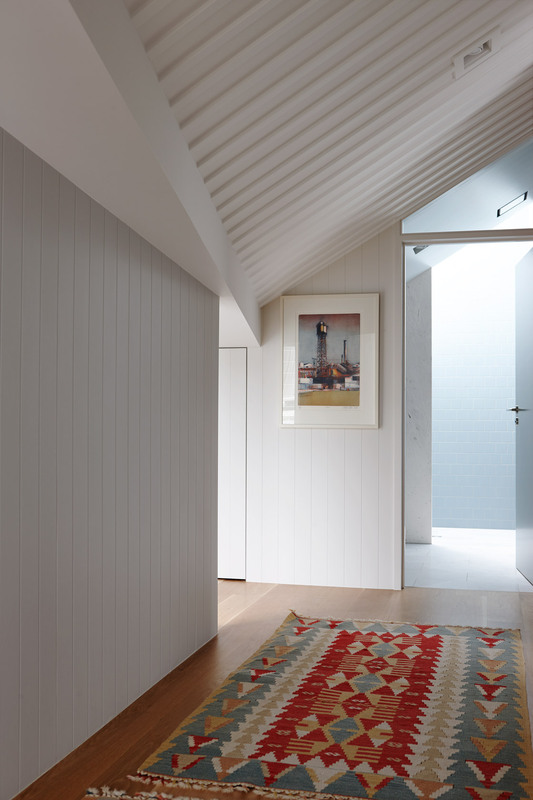 A new entrance, bedroom, ensuite and laundry were excavated in the north-east corner of the house. 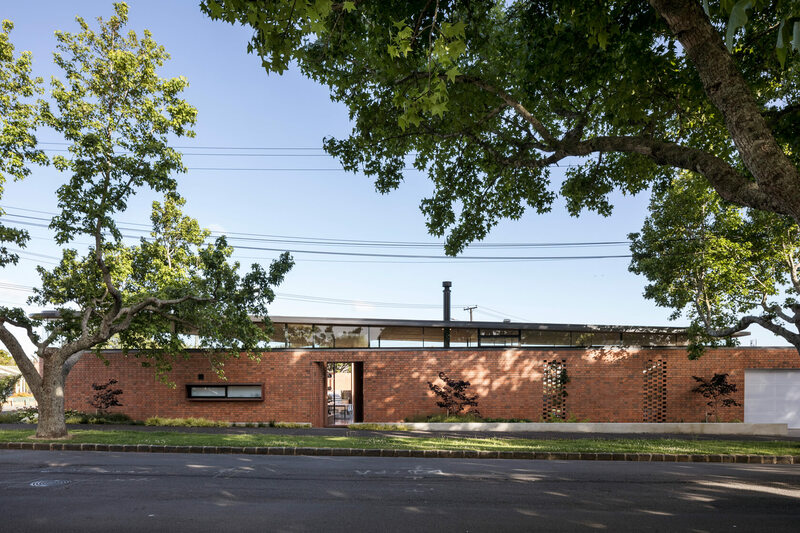 The contemporary language of the addition forms a strong contrast between old and new, intensifying the experience of both. 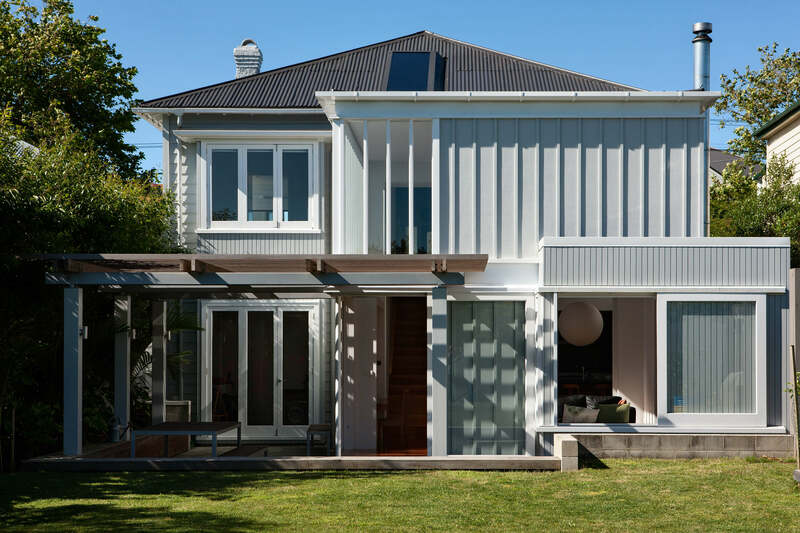 Alterations and additions to this 100-year-old home in a heritage zone resulted in a radical reorganisation and enhancement of its interior spaces, plus the addition of an elevated, shuttered outdoor room. 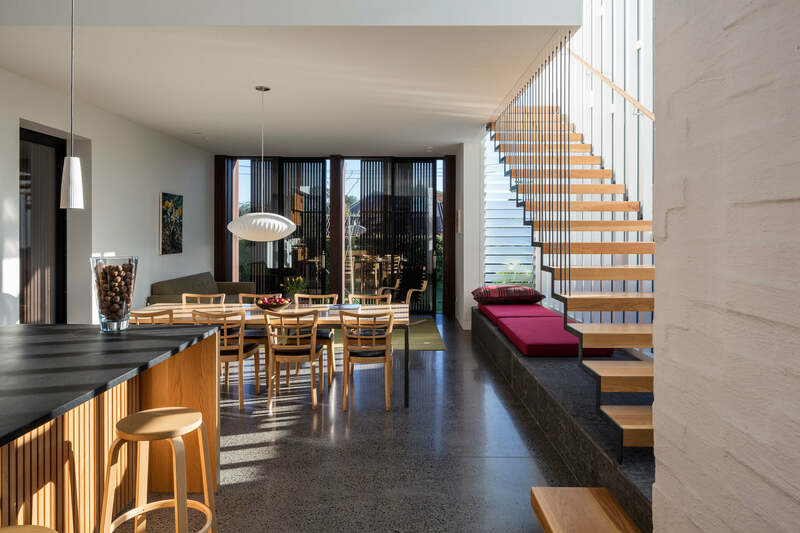 With upstairs living areas originally in an arrangement of disconnected spaces leading to an exposed verandah, the plan was recalibrated to create one generous light-drenched open-plan kitchen, dining, living space to take advantage of the house's generous proportions and city aspect. 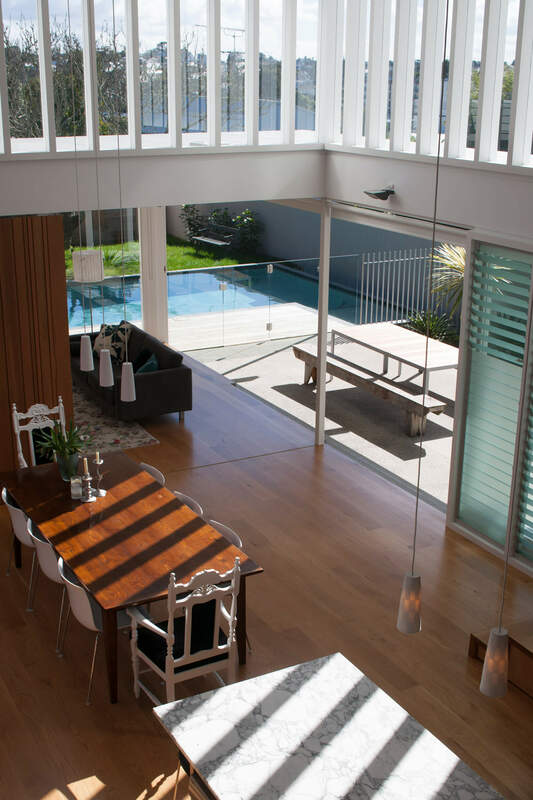 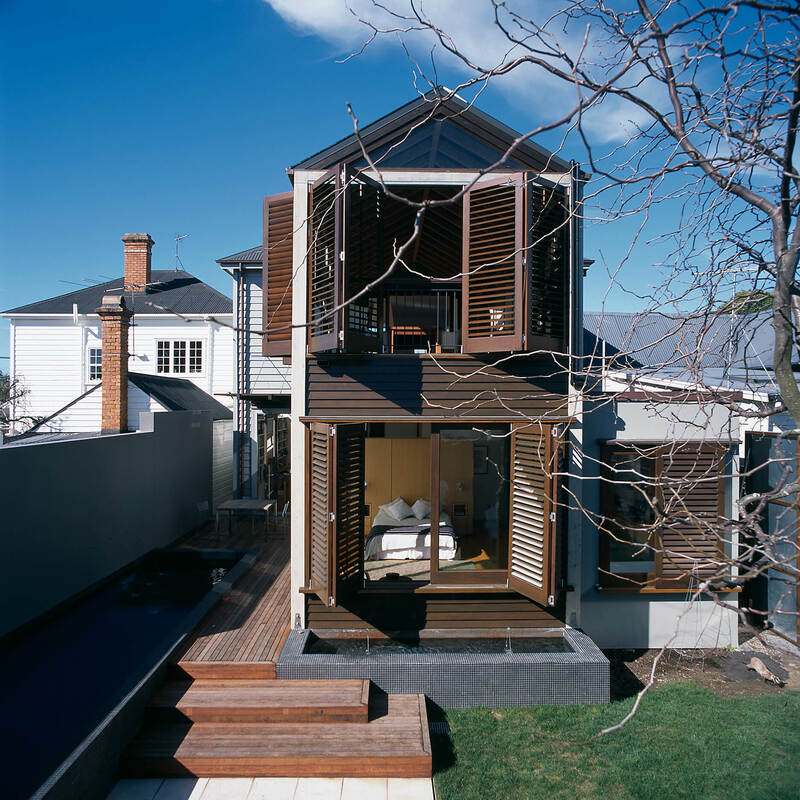 The deck was transformed into a gabled outdoor room screened with timber shutters that moderate enclosure and privacy. 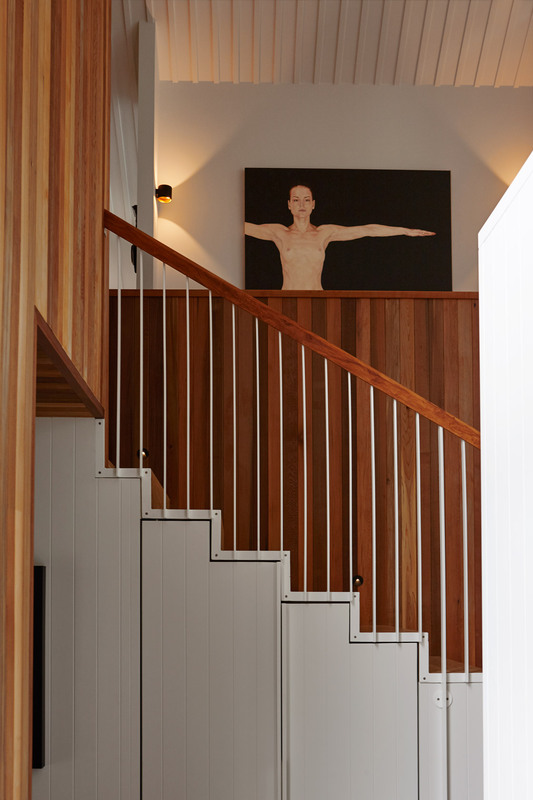 The downstairs was rearranged to accommodate a generous office, master bedroom with ensuite, and openings to the rear garden and a pool. 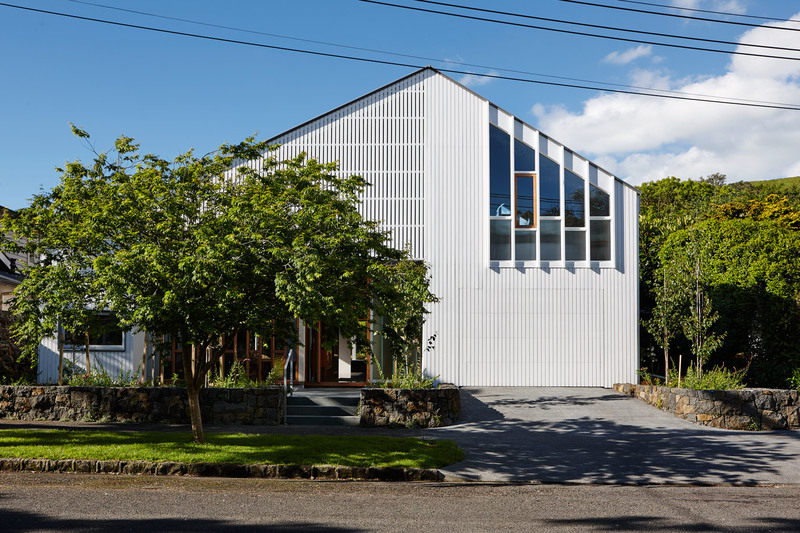 The gabled extension, with its stained weatherboards and kwilah louvred shutters, is clearly expressed as a new element rather than attempting to mimic the language of the existing house. 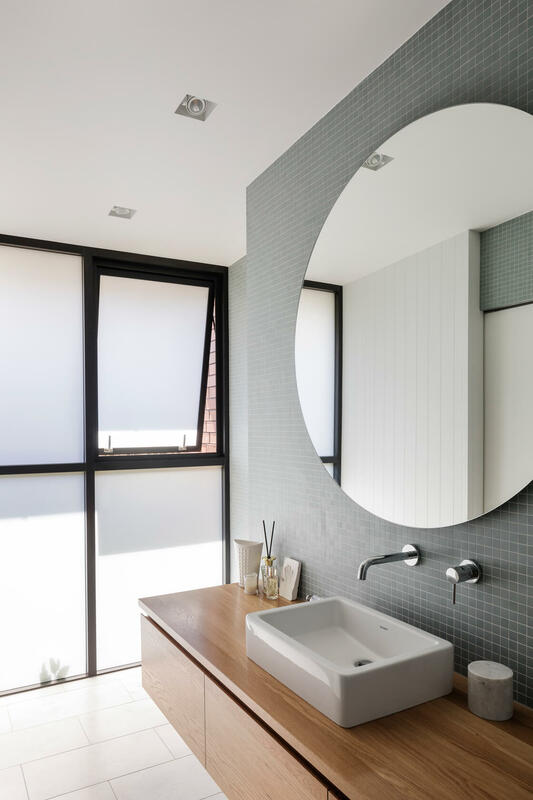 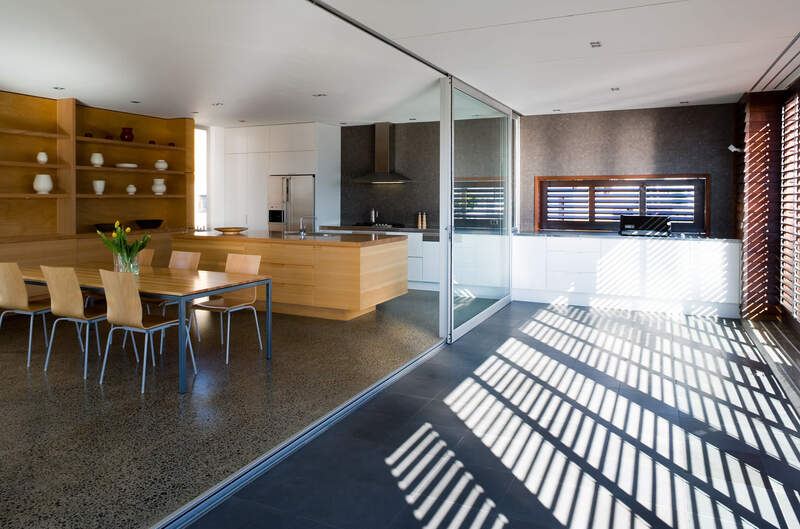 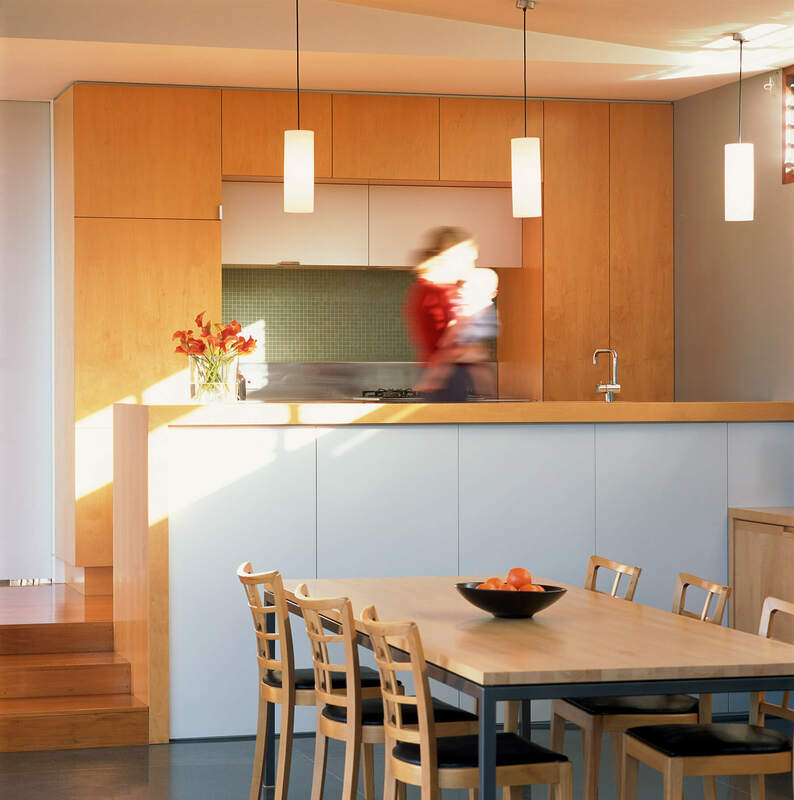 An unforgiving 1940s concrete box with few redeeming features was the starting point for this family home, transformed with a pavilion-style extension that increased the floor area from 90 square metres to 140 square metres. 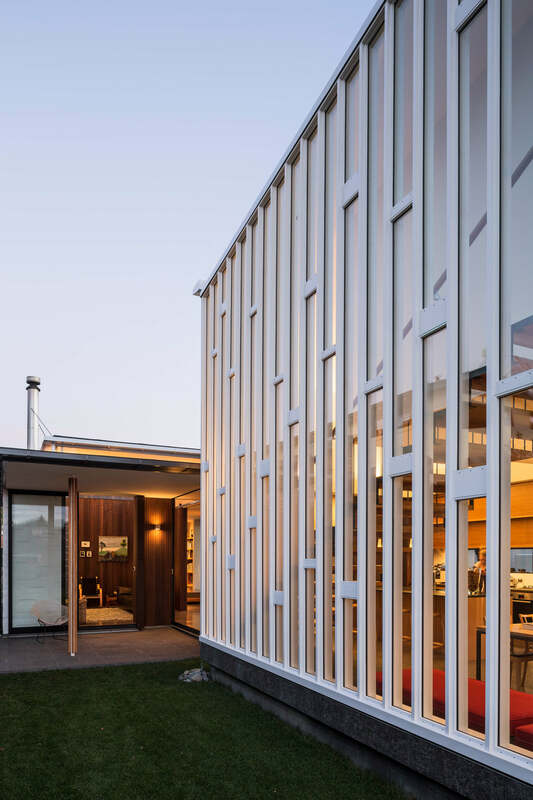 The solidity of the original structure is contrasted with sliding glass doors that fully open the pavilion's northern side to a paved terrace that adds another 50 square metres of outdoor living area. 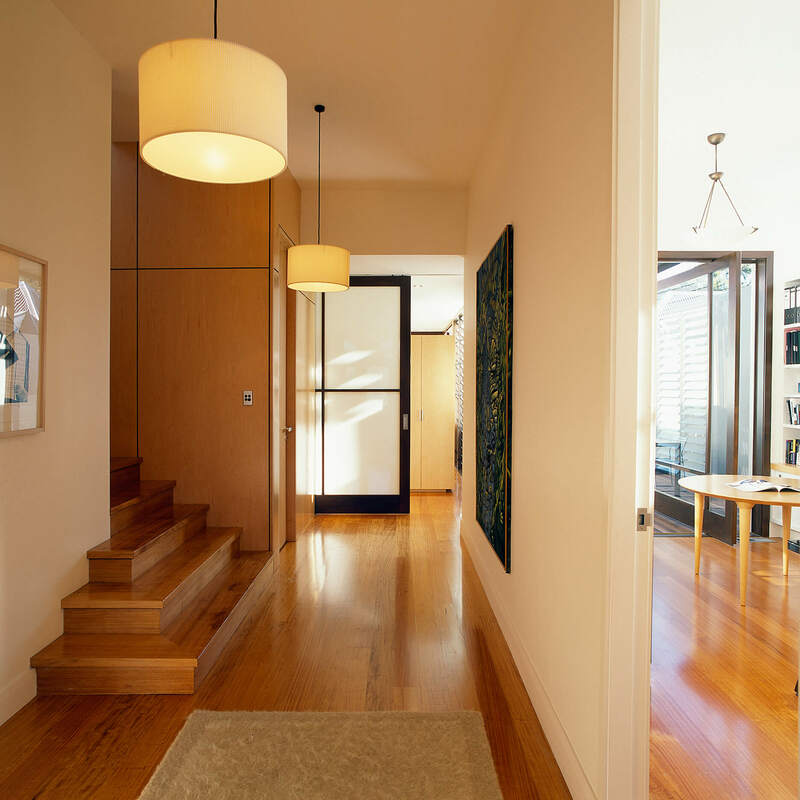 Three bedrooms and two bathrooms are located in the original part of the house, with a change in level marking the transition between old and new. 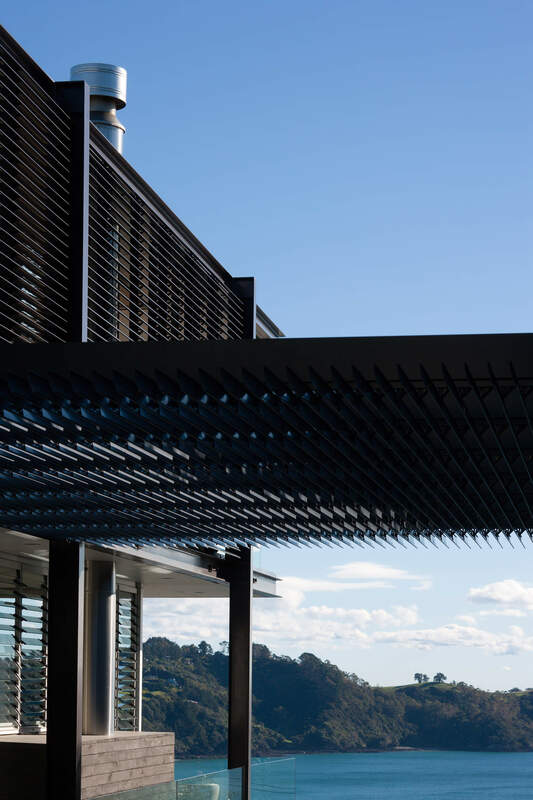 The pavilion's elegant floating roof echoes the original house's monopitch roof form, with high louvres running the length of the space to provide cross breezes. 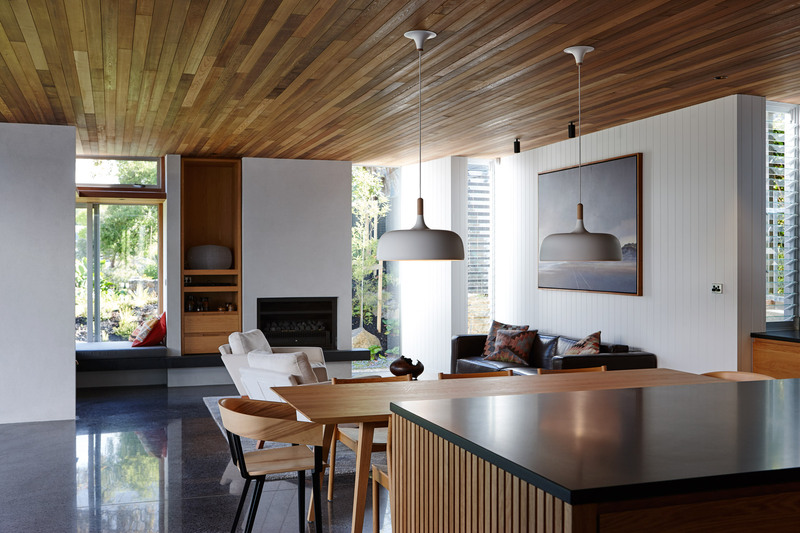 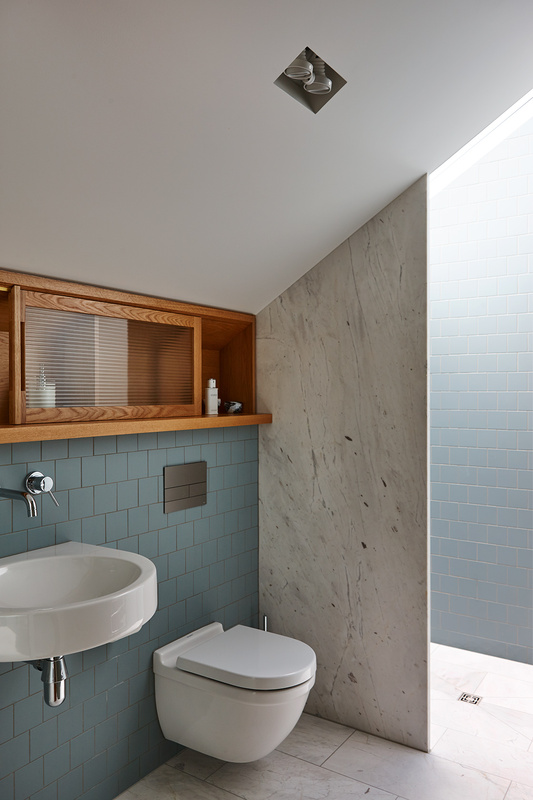 The restrained palette of materials – terrazzo, timber and plastered block – add to the sense of space and calm in what is now a generous contemporary home. 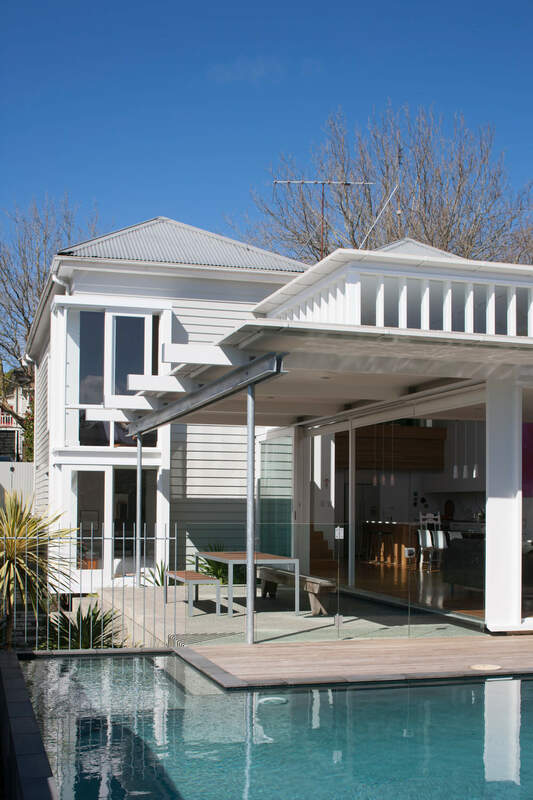 Alterations to this pretty bay-fronted villa focused on connecting living spaces to the garden, while also harnessing as much warmth and sunlight as possible on the south-facing site. 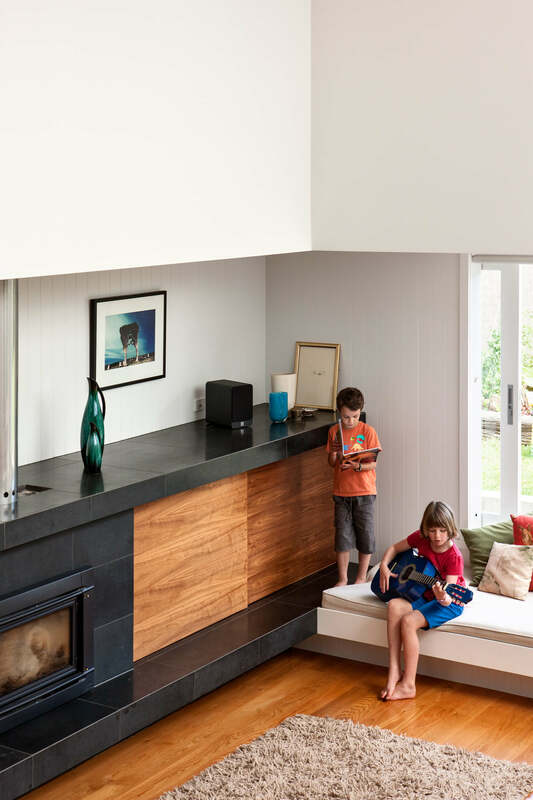 Excavations beneath the villa accommodated a children's rumpus room and kitchen. 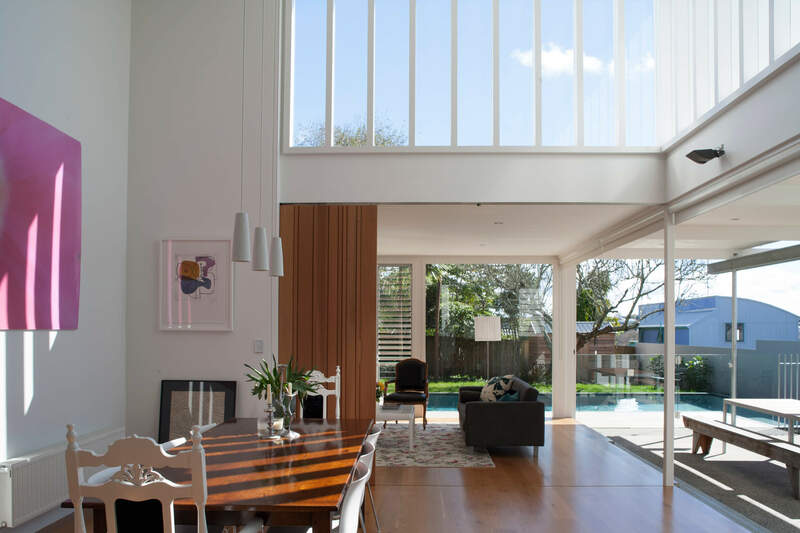 Dining and living spaces are accommodated in a generous double-height addition surrounded by westerly-facing windows to pull in as much afternoon sun as possible. 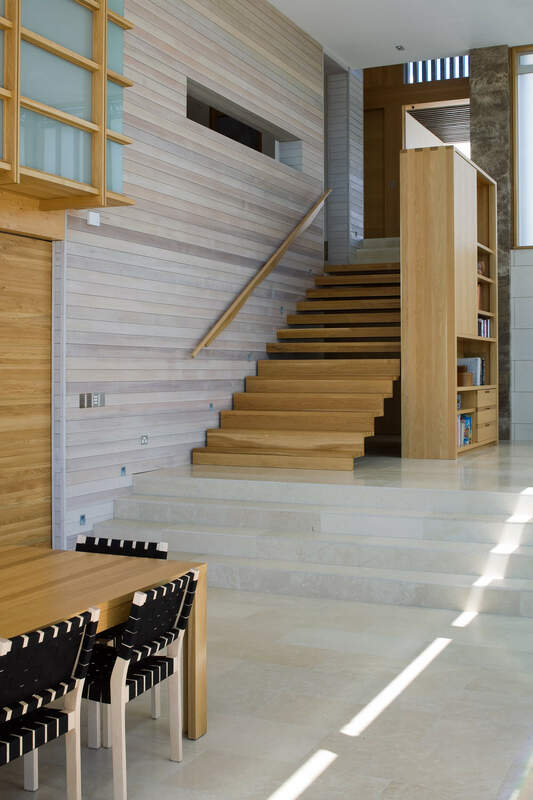 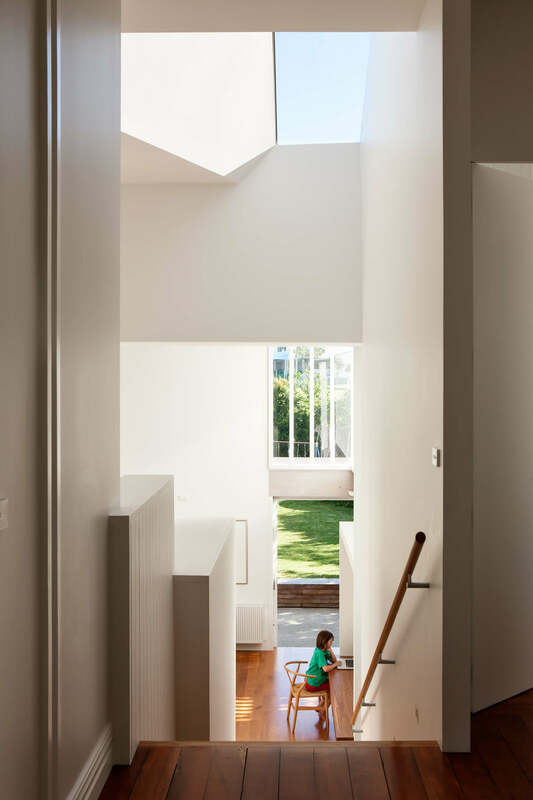 Morning light penetrates the space through a carefully positioned skylight above the generous stair that links the original house to the addition. 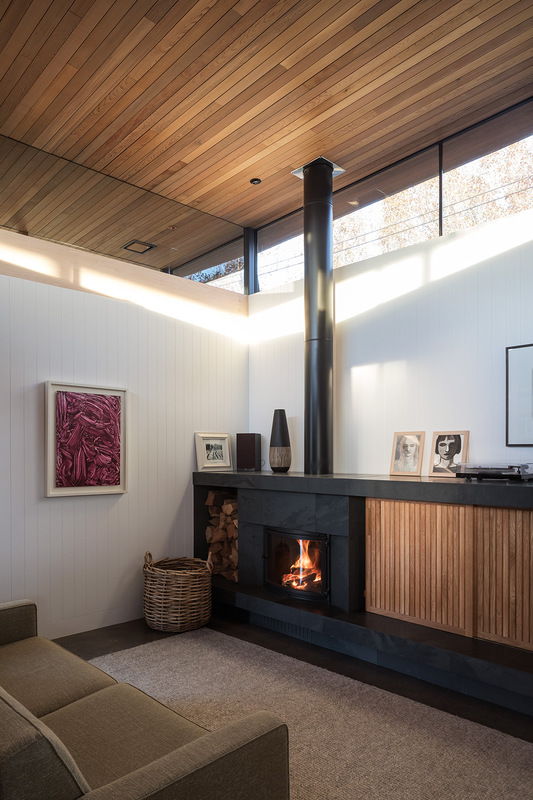 Though open-plan, the new addition has clearly articulated zones, with a change in ceiling height enclosing a window seat that creates a more intimate sitting area around a fire. 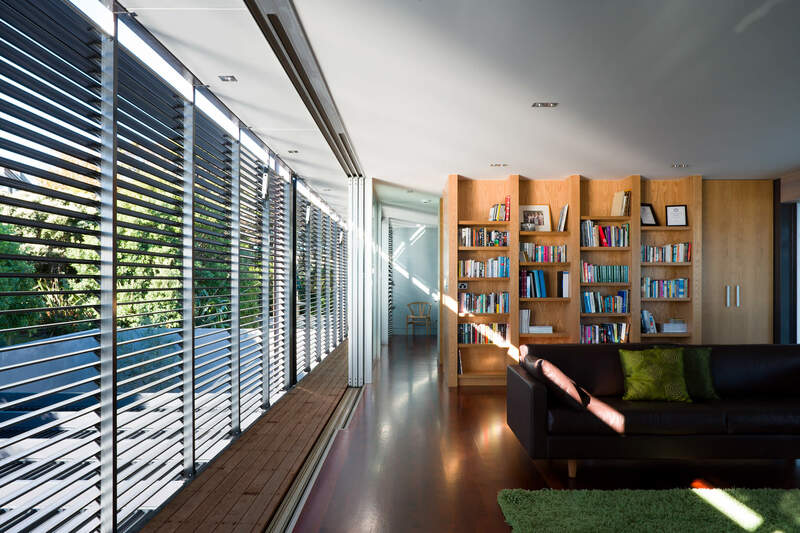 Openings to the garden are carefully modulated and scaled to the language of the villa. 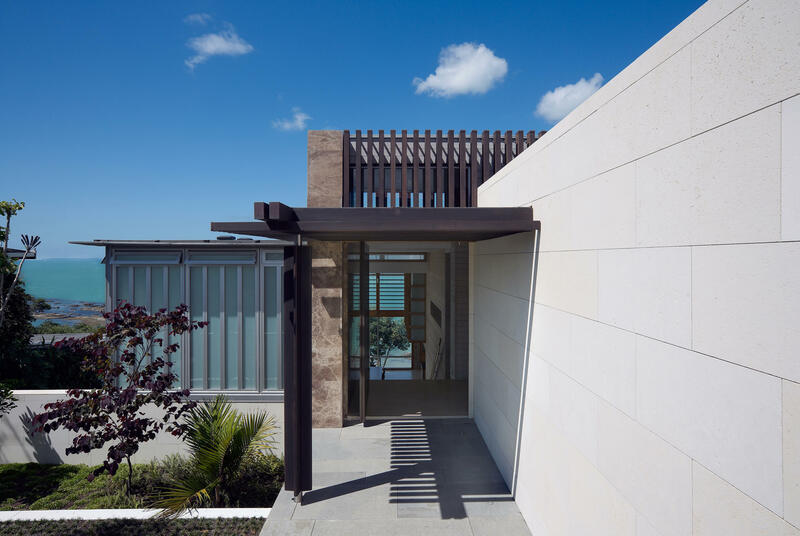 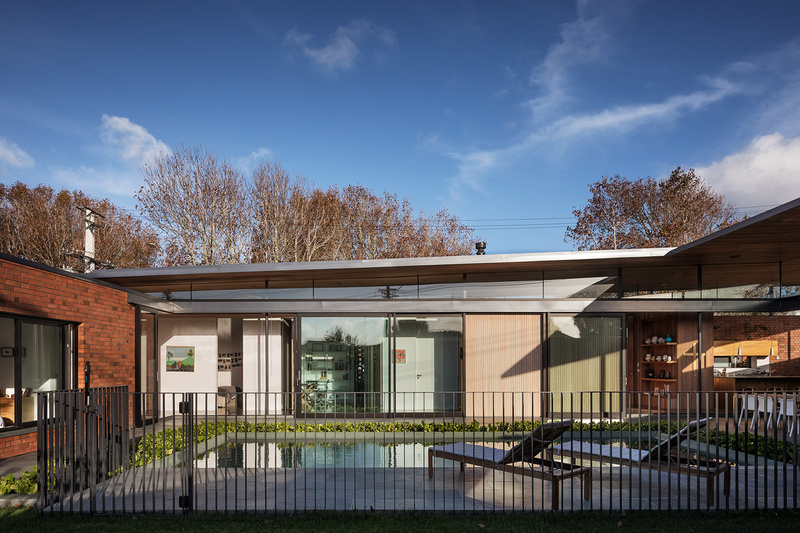 Painted ship-lap cladding and timber joinery reinforce the villa typology.